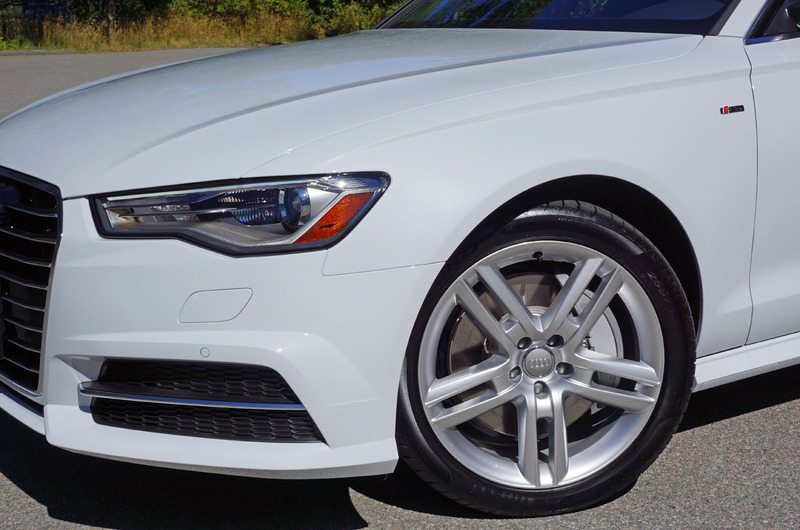 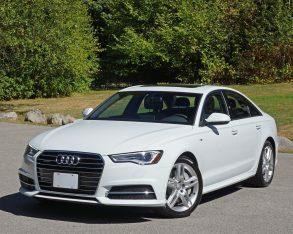 Just one look at the Audi A6 and it’s easy to see why it’s become one of the most popular mid-size models in its premium class. 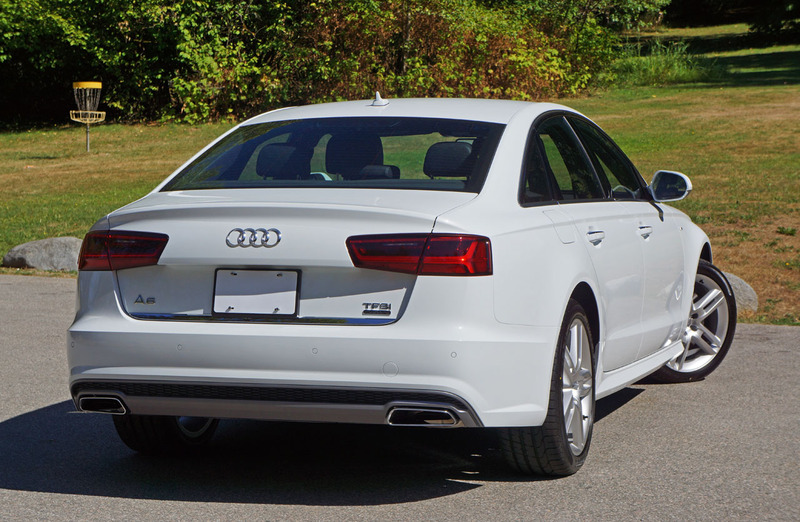 It’s not all that different in design from other Audi sedans, but for some reason the larger its cars get the more proportionally attractive they become. 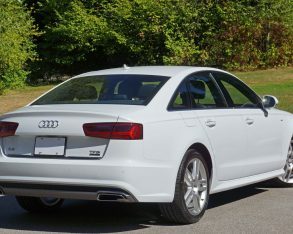 help to deliver sportier more purposefully planted poise when seen from the rear. 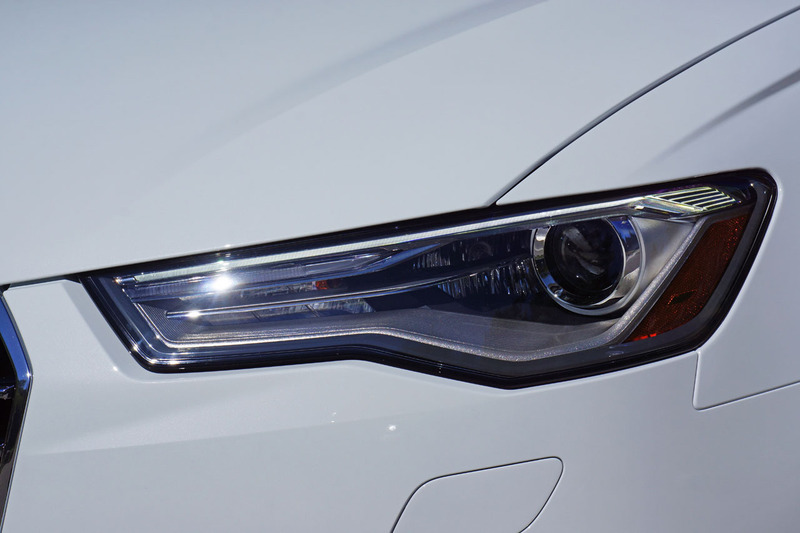 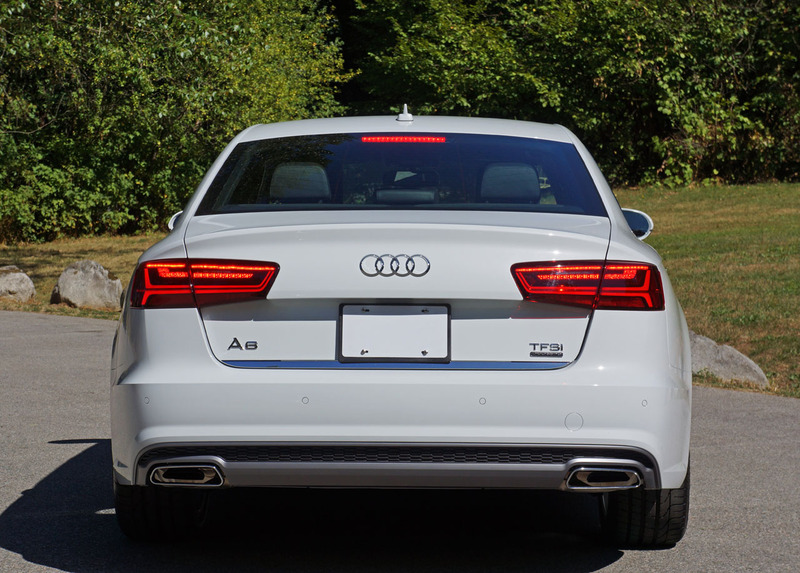 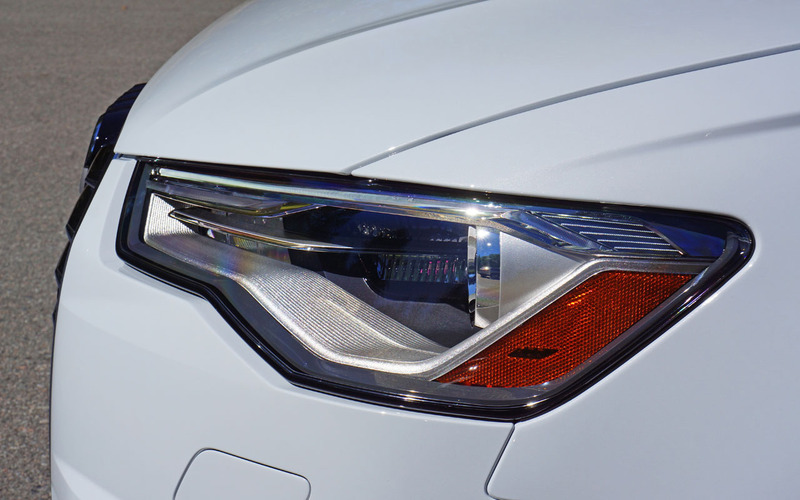 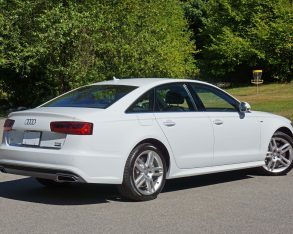 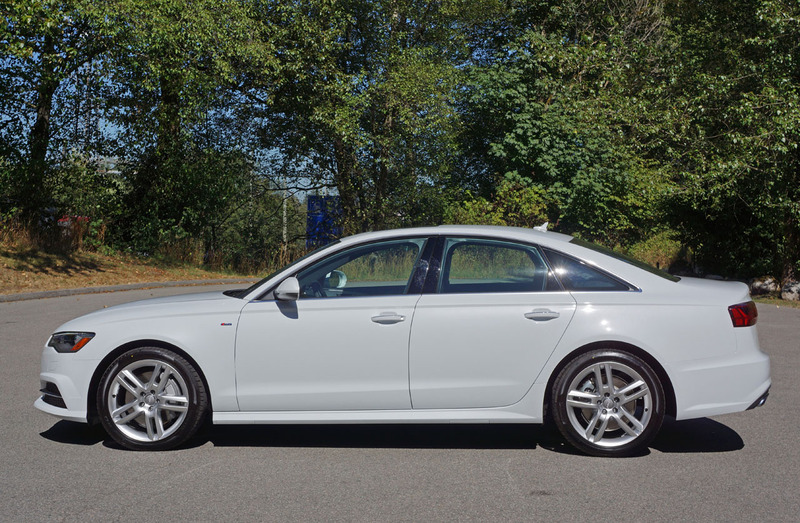 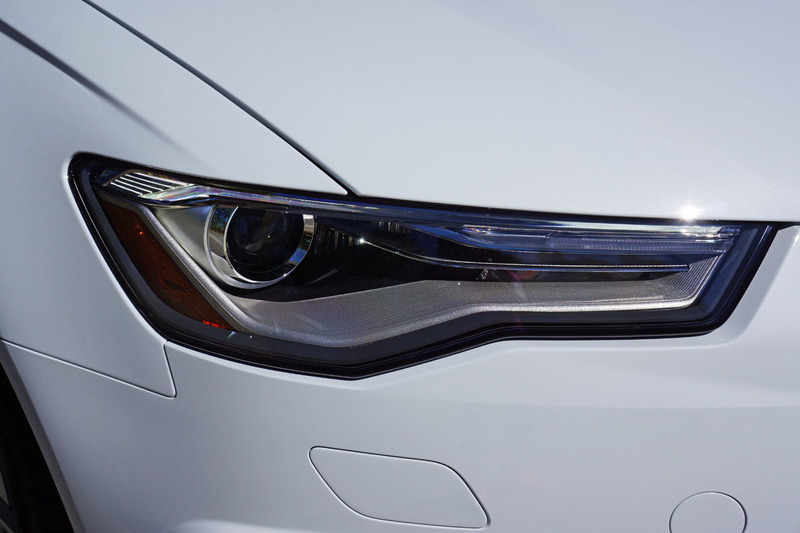 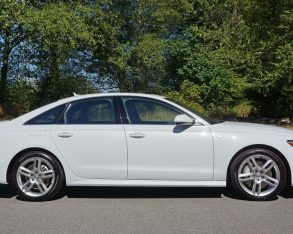 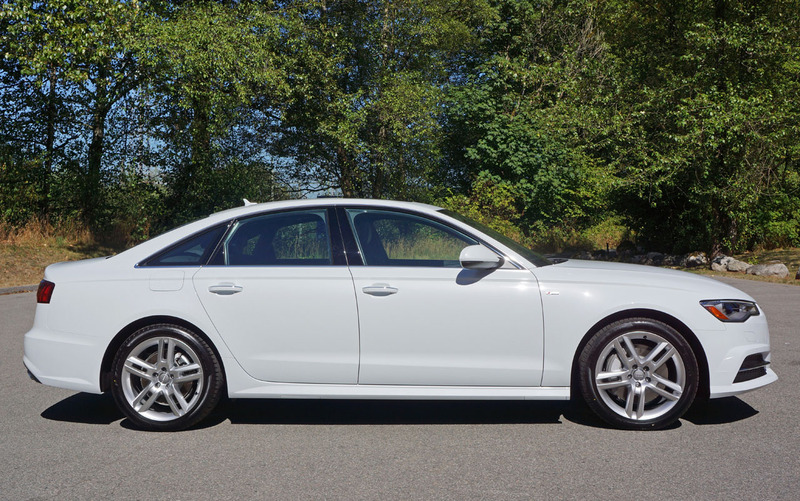 The reworked 2016 A6 might best display the brand’s noted style, its sheer Audi-ness clearly visible from a mile away. 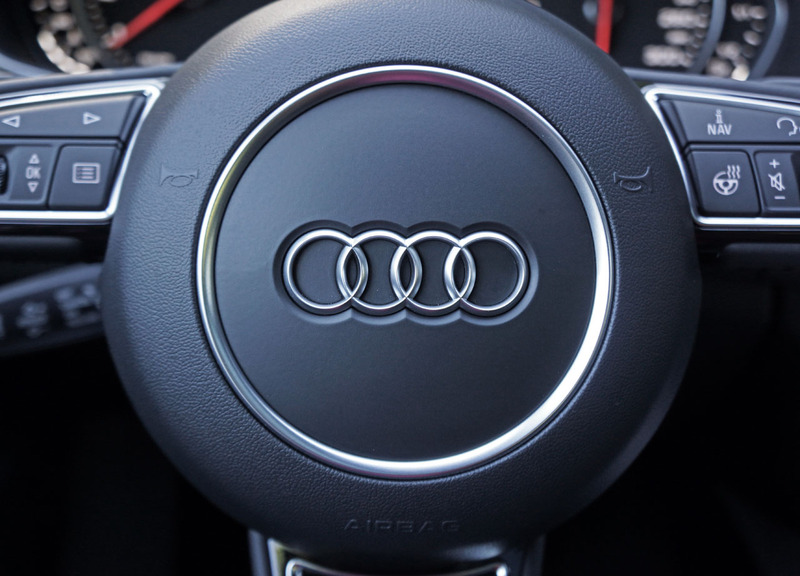 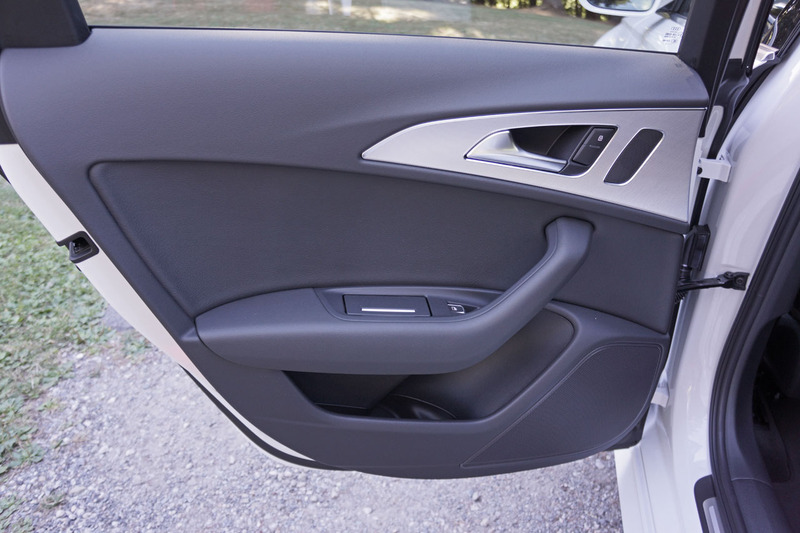 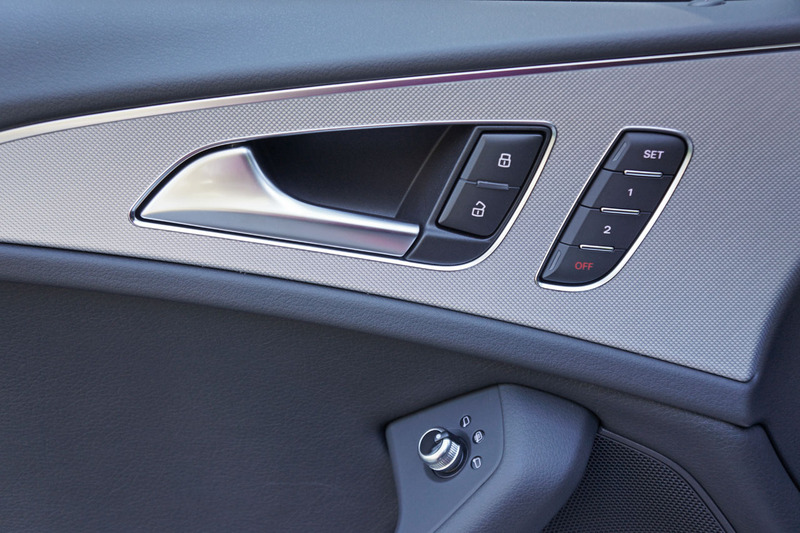 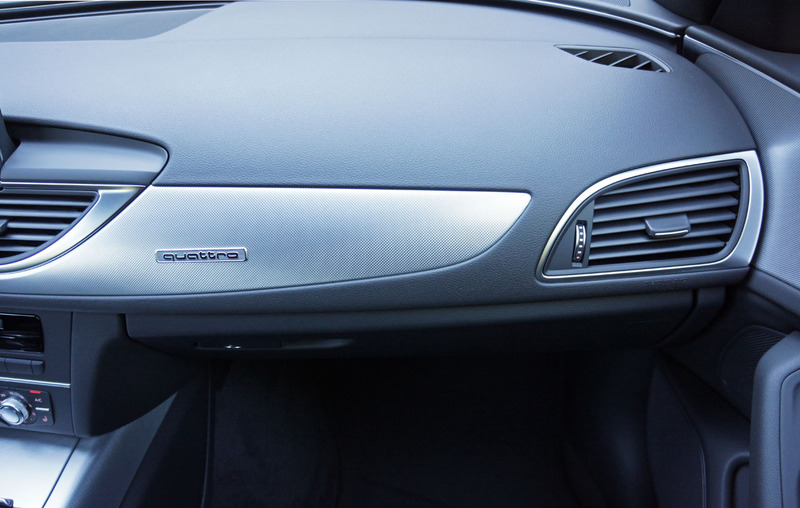 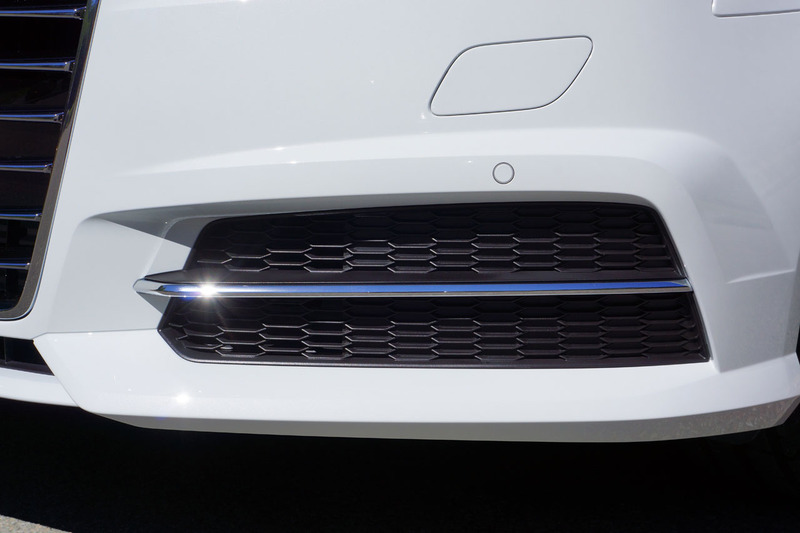 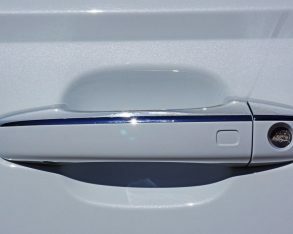 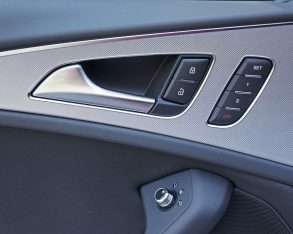 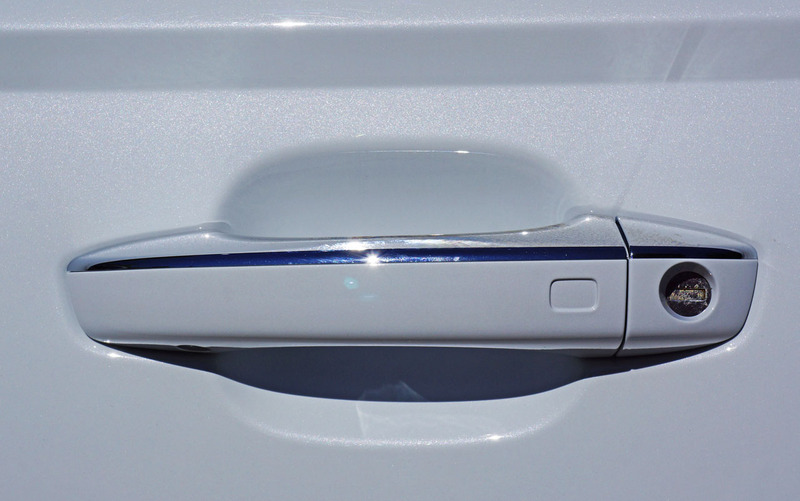 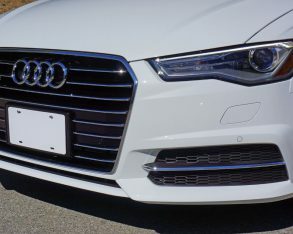 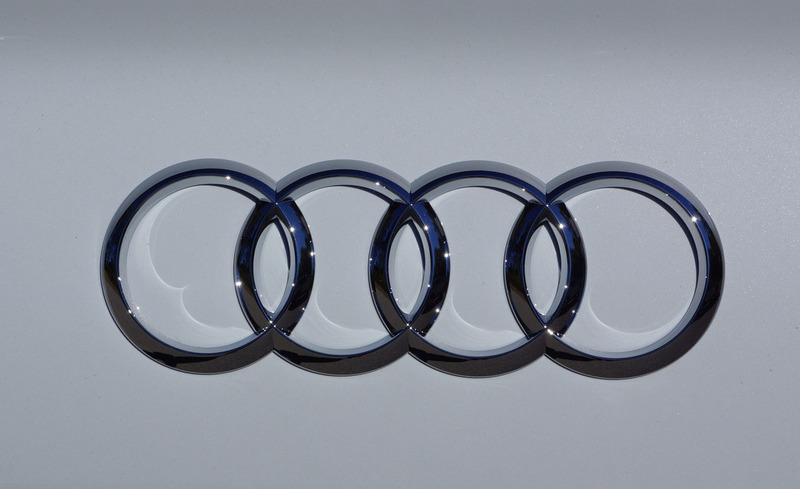 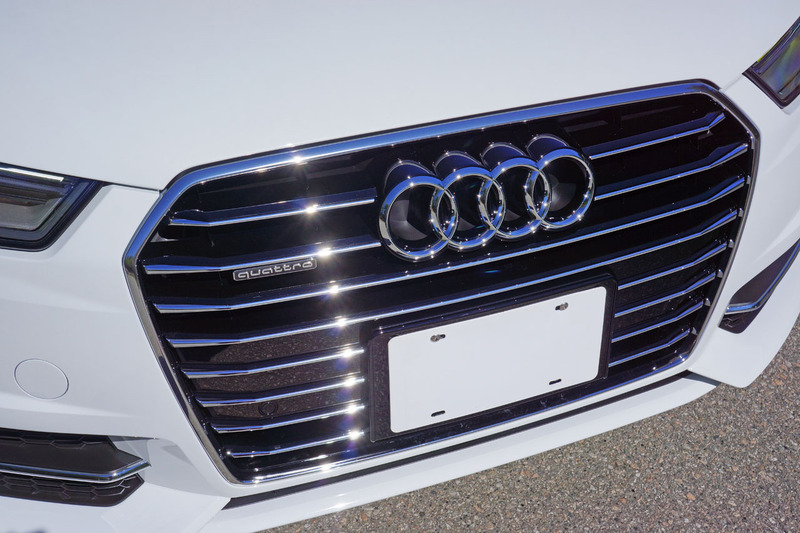 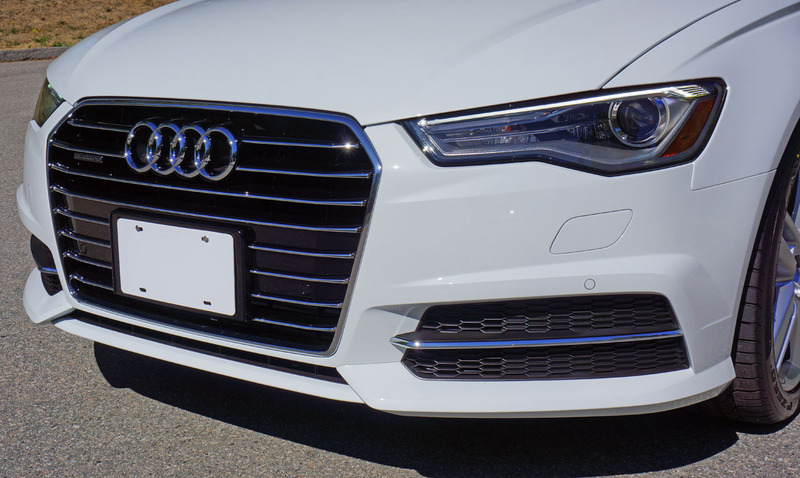 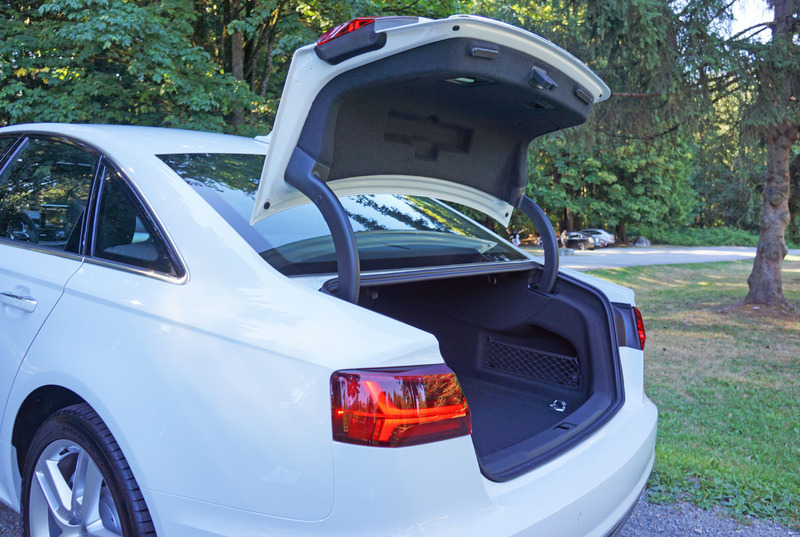 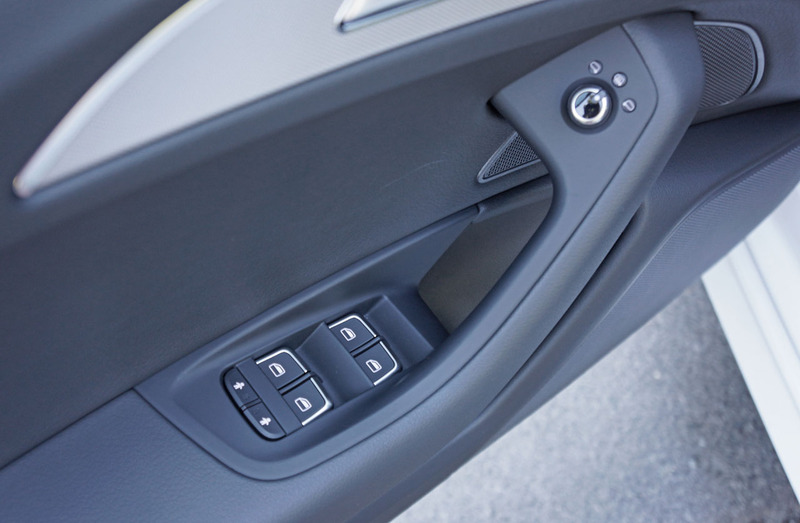 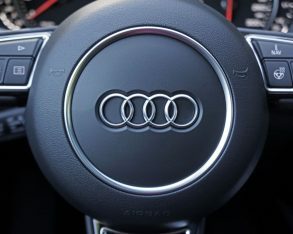 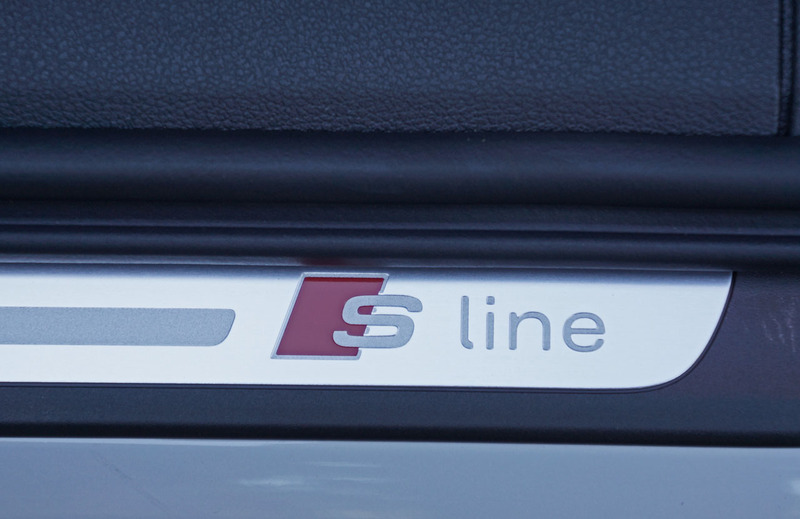 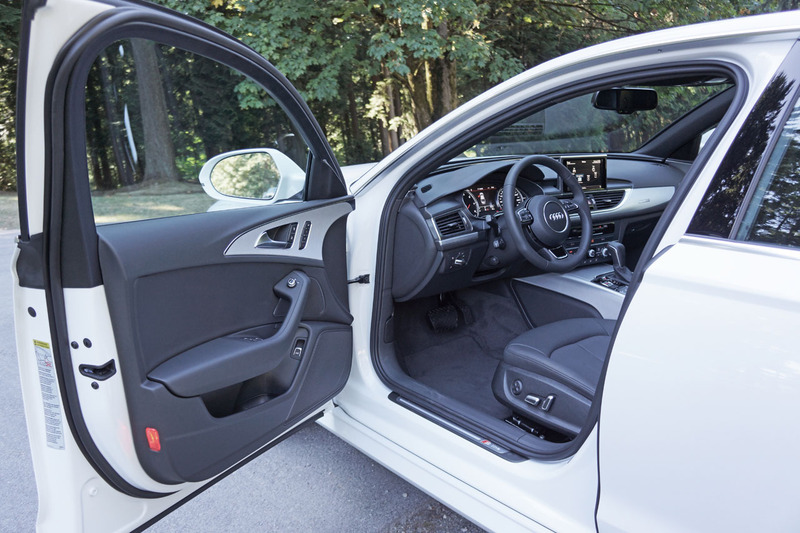 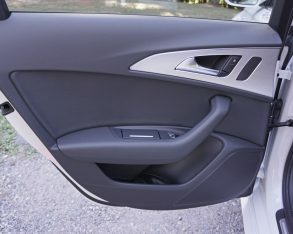 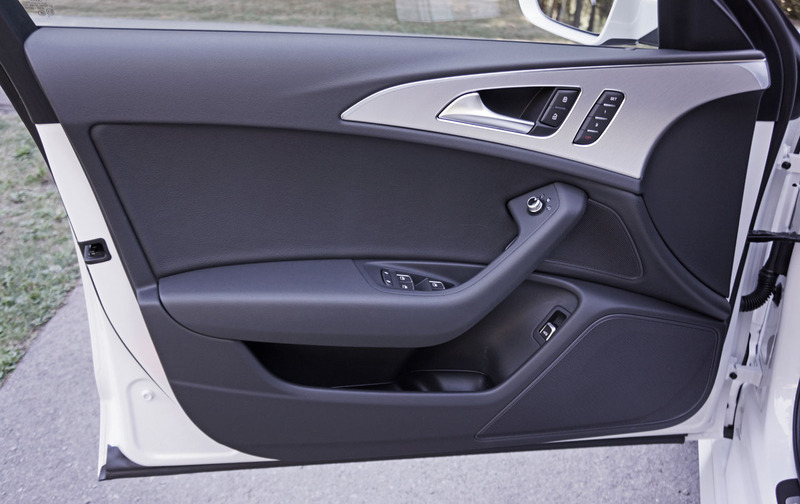 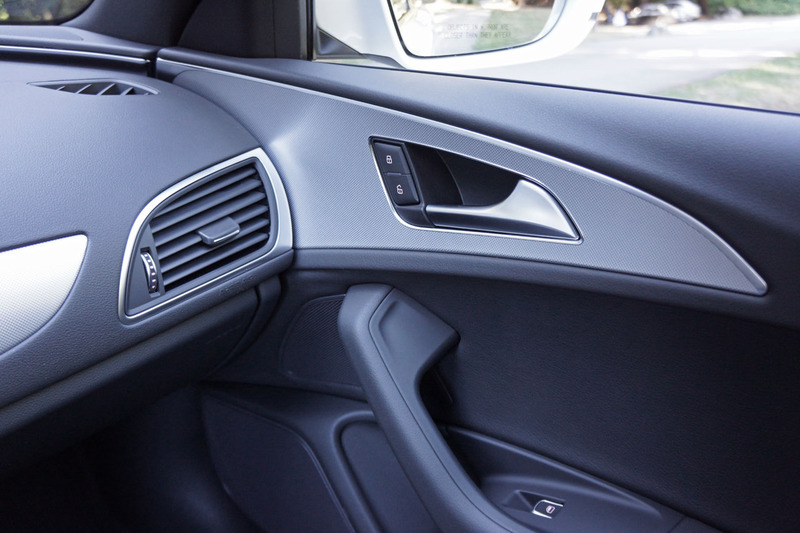 handle, not to mention beautifully finished metal trim surrounding the doorframe; Audi truly doesn’t hold back when it comes to metal brightwork. 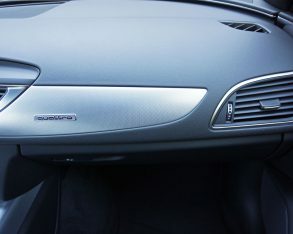 at all costs brand like Lotus, so therefore premium consumers deservedly expect more. 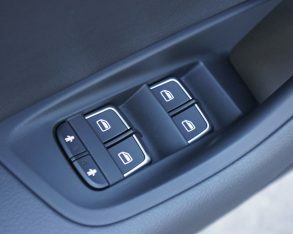 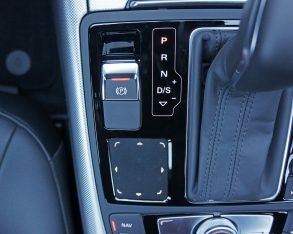 Likewise, most of the switchgear isn’t as tight fitting and well damped as others in the class, an attribute that Audi once made a name for. 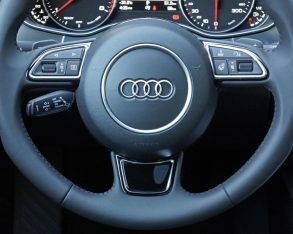 Is such the price of sales success? 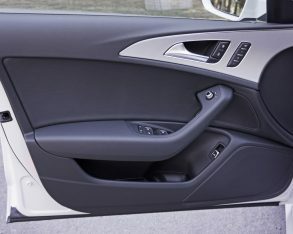 On the positive, as long as you don’t touch, it all looks gorgeous. 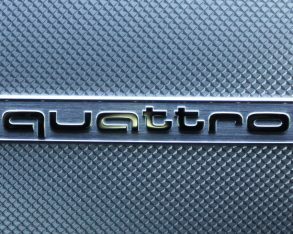 maneuver around curvaceous onramps and then effortlessly sweep past slower highway traffic as good as it gets in this segment. 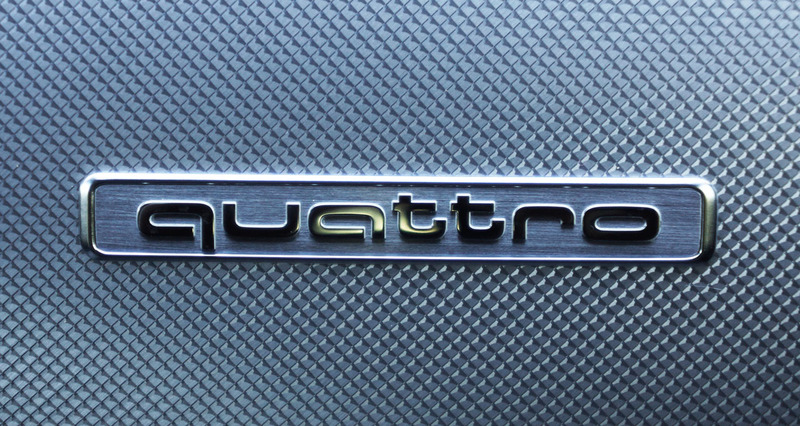 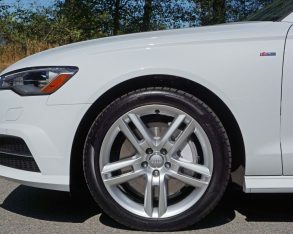 This is the real reason to own an Audi, and it’ll do all this and more as stably in the wet as it does in the dry thanks to Quattro all-wheel drive, not to mention dual-circuit, diagonally split ABS-enhanced four-wheel disc brakes with electronic brake-force distribution, electronic stability control and even a brake disc wiping feature that keeps the rotors ready no matter the weather. 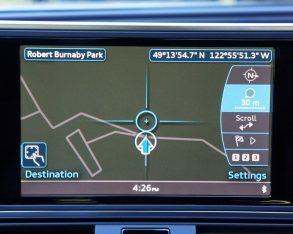 much easier and quicker mode modulation (I tend to flick back and forth between eco mode, when available, and sport mode all the time, while sometimes using comfort settings for long highway stints or rough pavement), but it’s there when needed and is well worth the screen time to locate it. 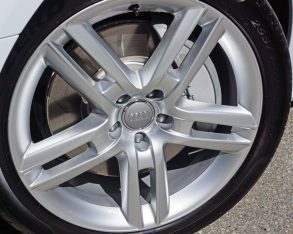 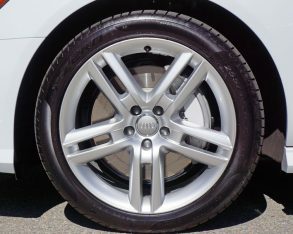 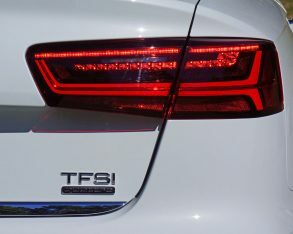 wheel spokes, which deliver extremely quick and positive response to input with Dynamic mode engaged, while when more conservatively driven the A6 2.0 TFSI is good for a five-cycle EnerGuide fuel economy rating of 10.8 city, 7.3 highway and 9.2 combined, which is actually better than last year’s rating despite the power upgrade. 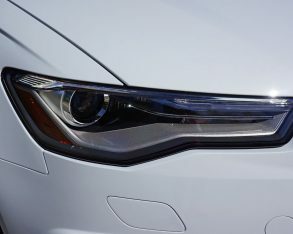 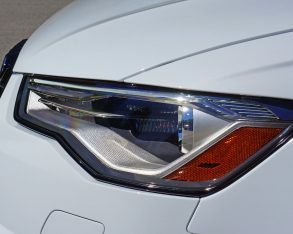 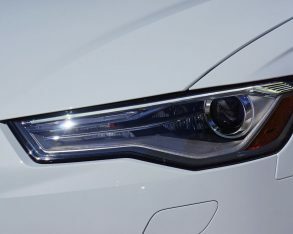 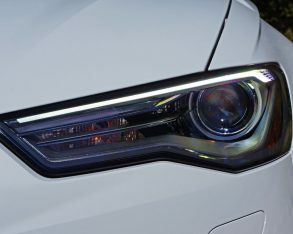 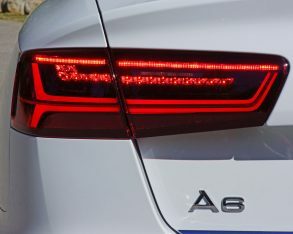 That’s quite efficient for a 1,725-kilo (3,803-lb) sport-luxury sedan by the way, although that curb weight is 15 percent lower than its predecessor and also lighter than the class average due to high-strength hybrid aluminum body panels. 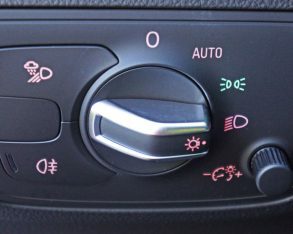 otherwise be idling, a great feature that also makes sitting at standstill quieter while reducing emissions from your immediate area let alone the entire eco-system. 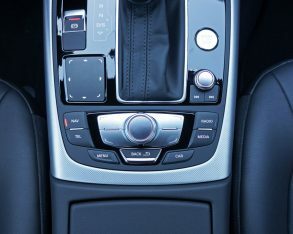 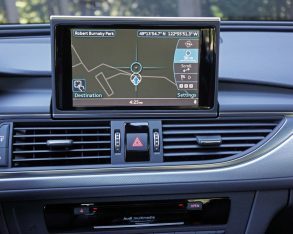 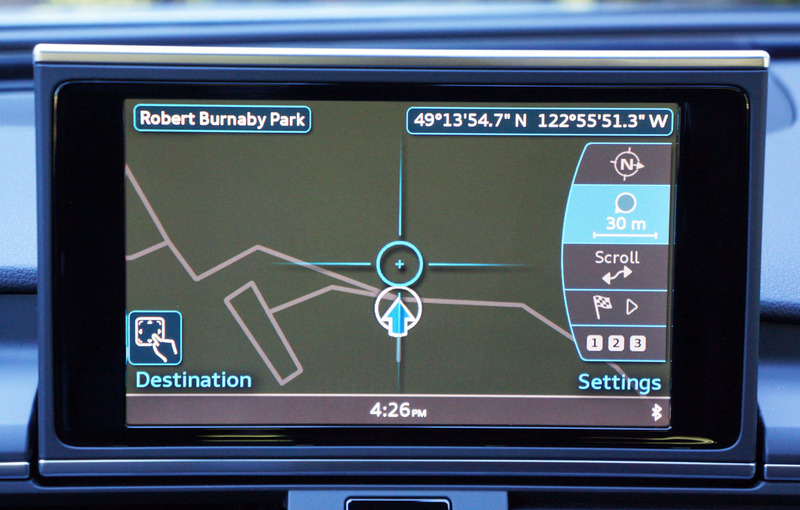 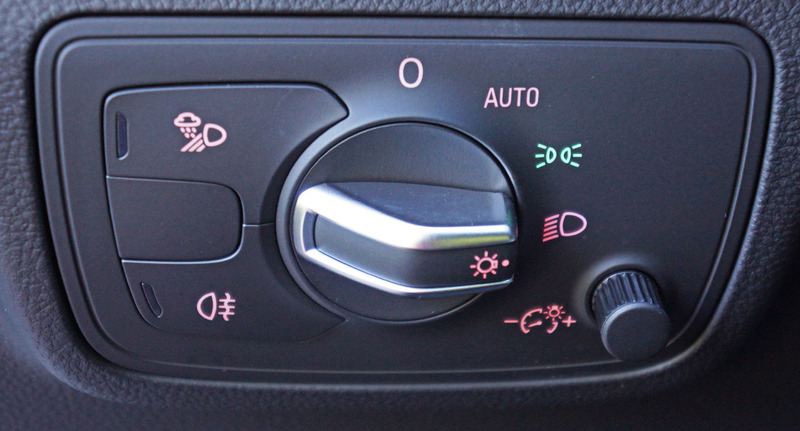 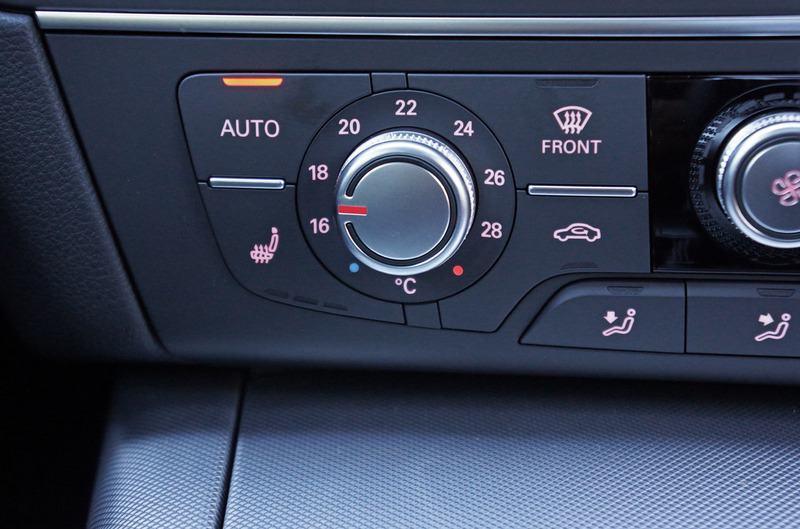 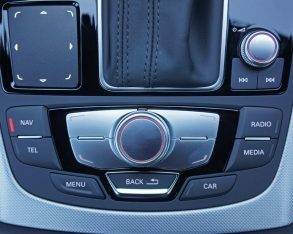 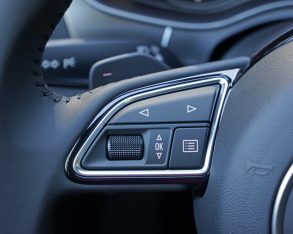 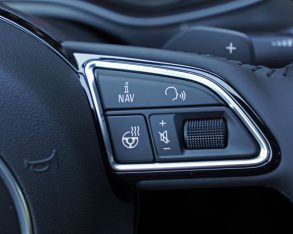 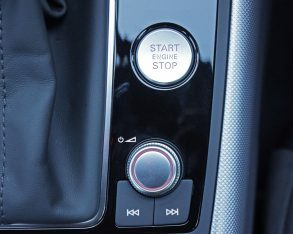 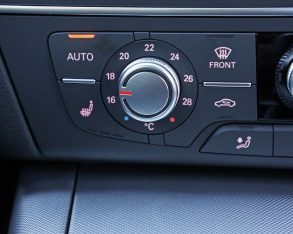 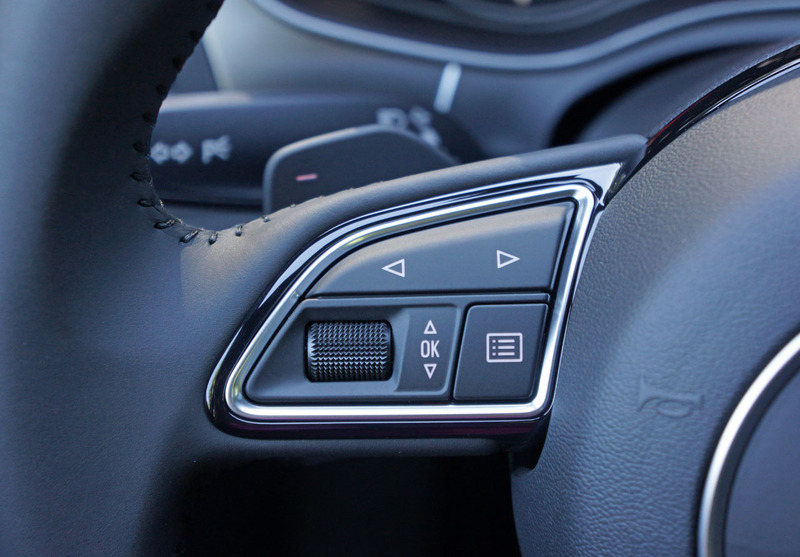 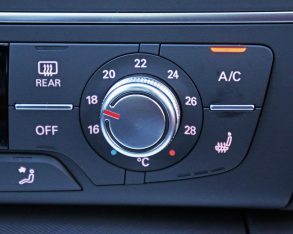 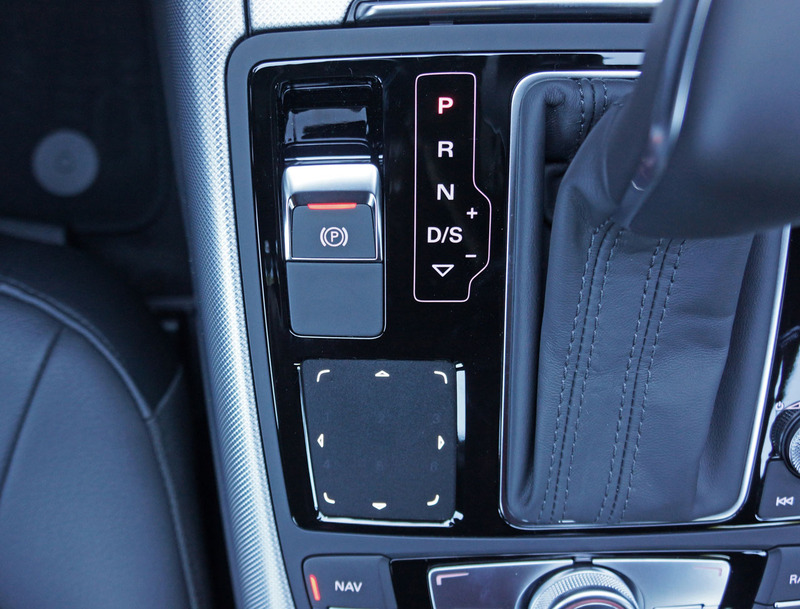 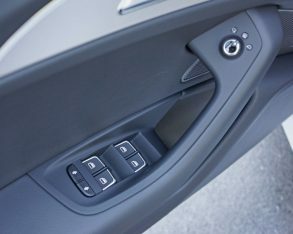 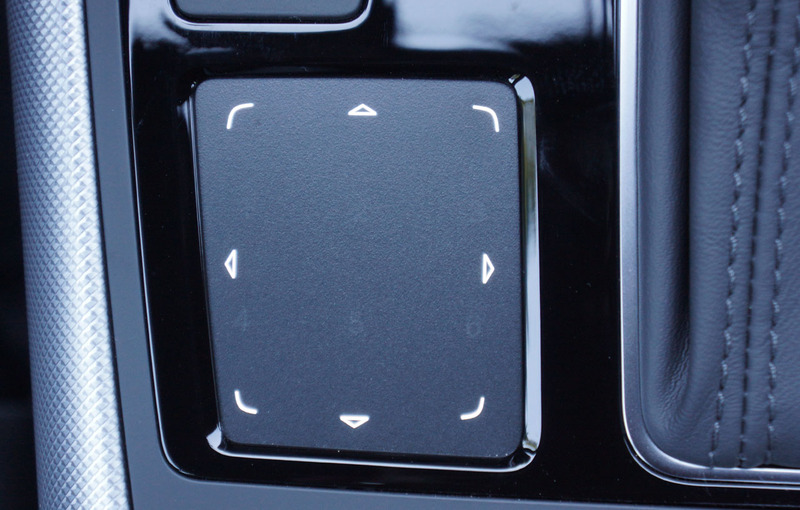 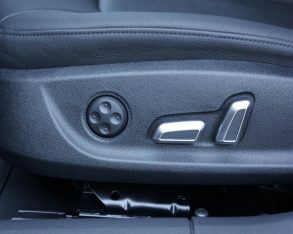 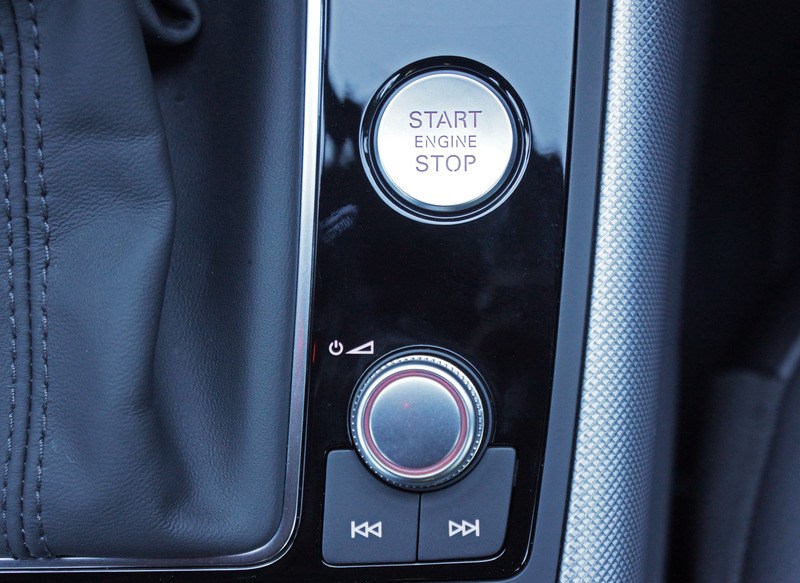 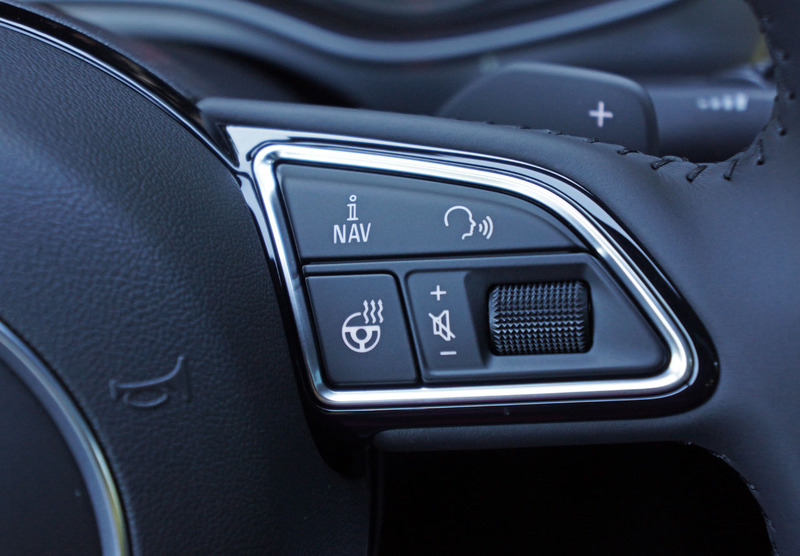 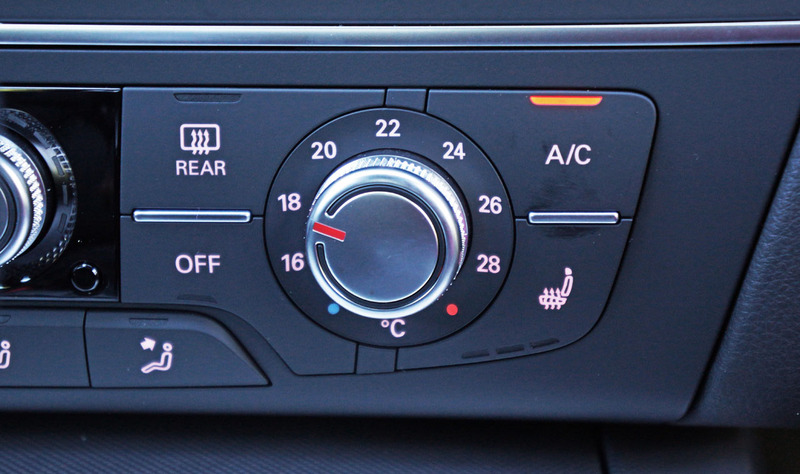 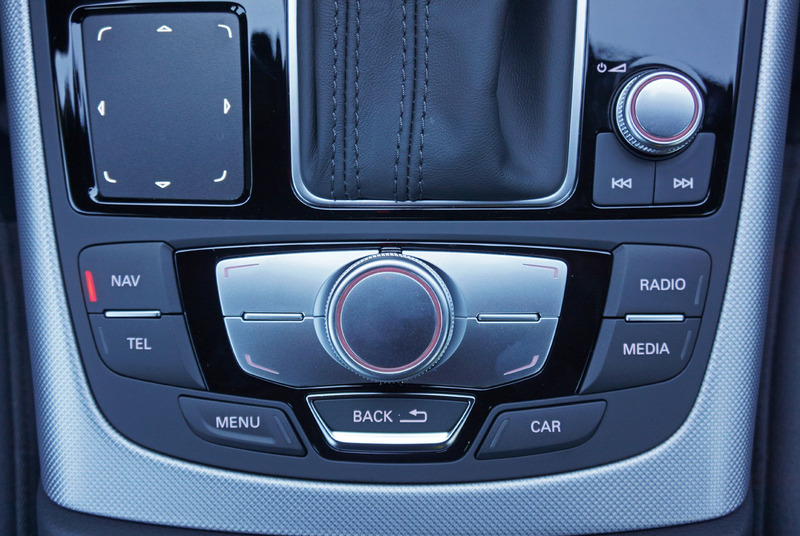 dial surrounded by a cluster of go-to buttons sits closest to the centre armrest, allowing easy access to just about any system within the car, while an innovative touchpad closer to the driver’s seat lets you prompt the system by drawing letters and numbers with your finger, not unlike some smartphone apps. 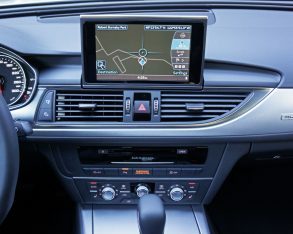 Even more important, the more intuitive MMI has been upgraded to a new MIB 2 Nvidia Tegra 30 processor that’s capable of processing up to eight billion computations per second for smoother, faster operation. 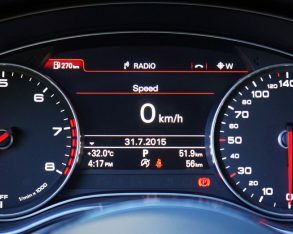 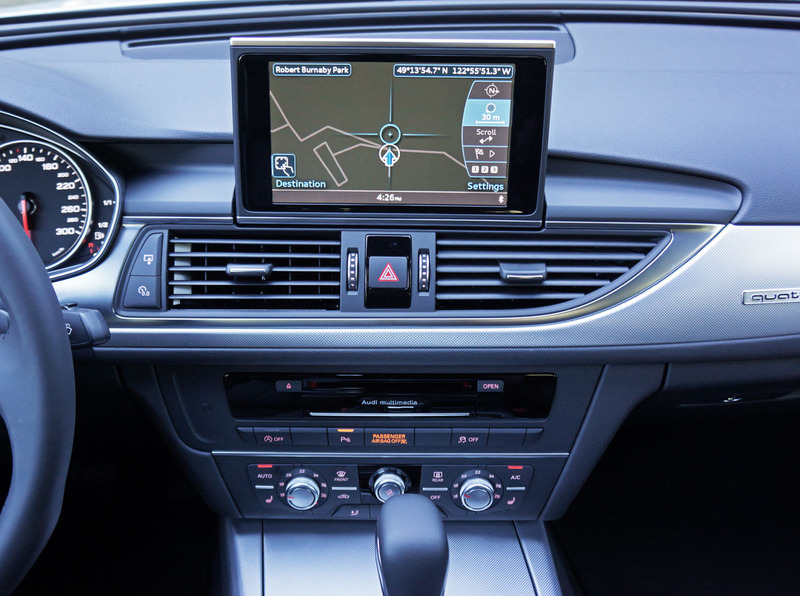 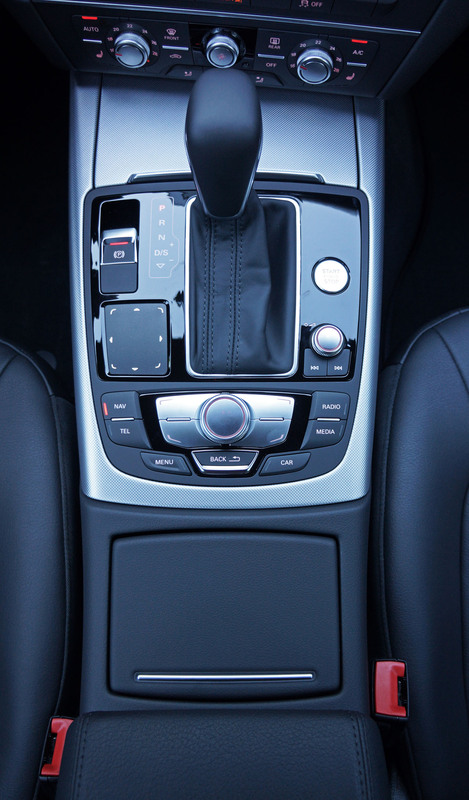 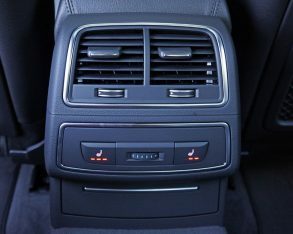 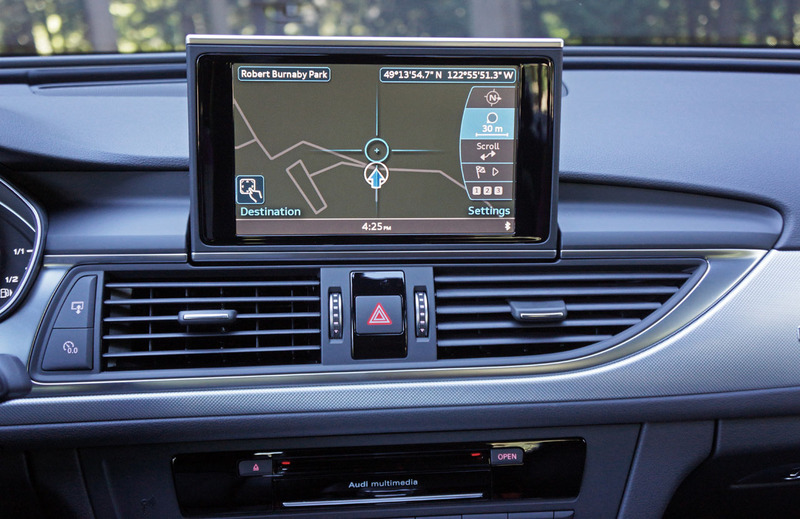 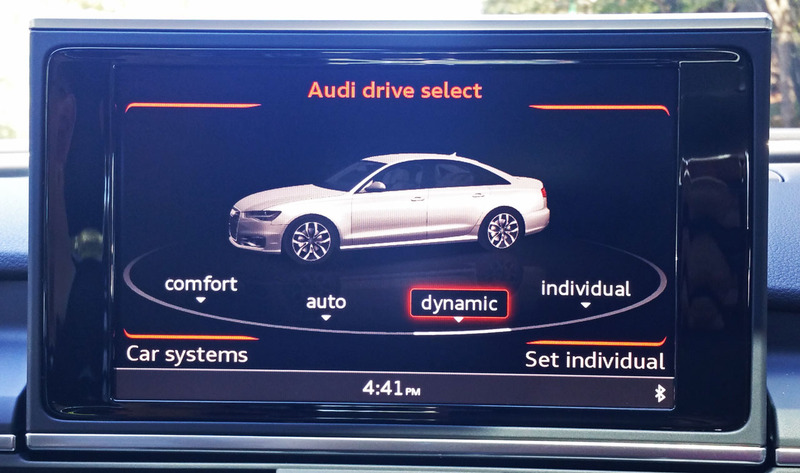 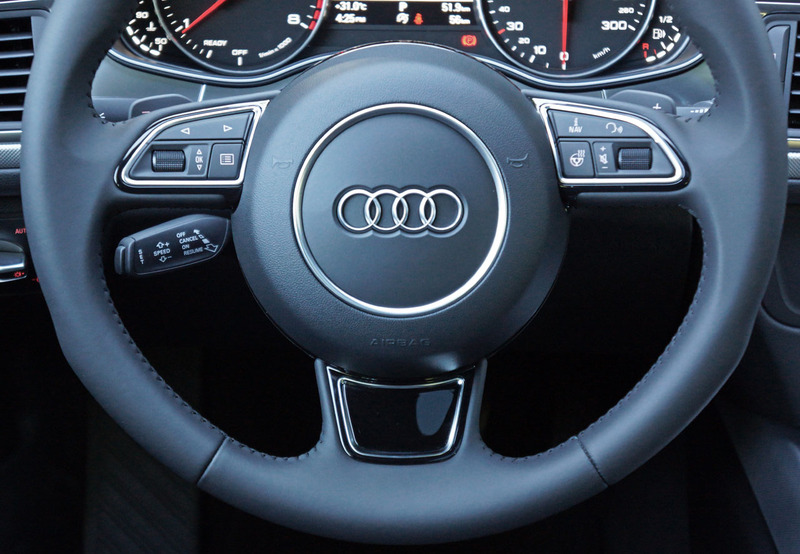 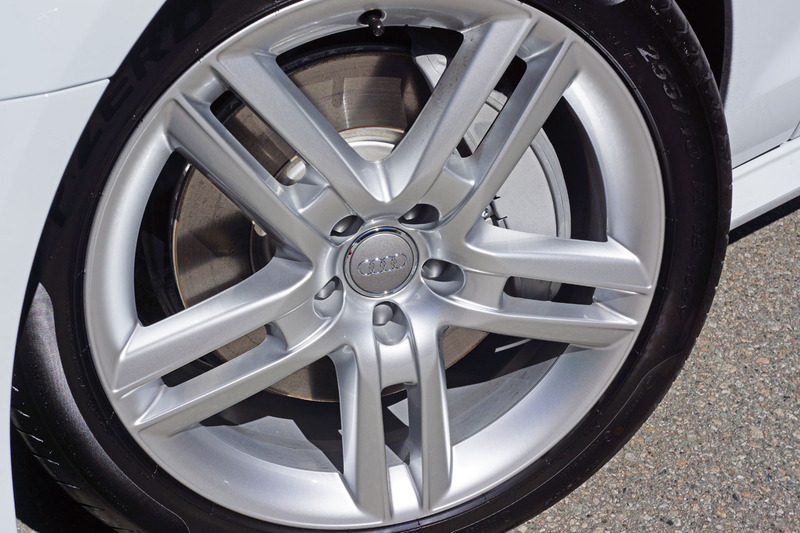 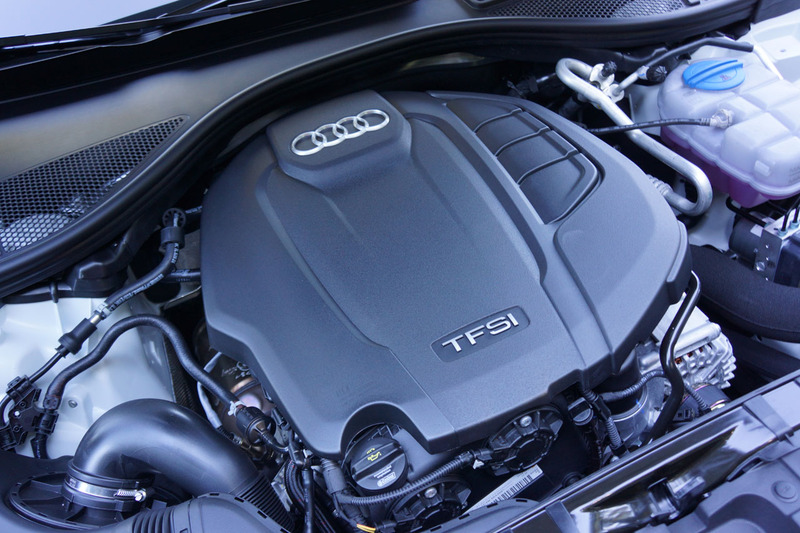 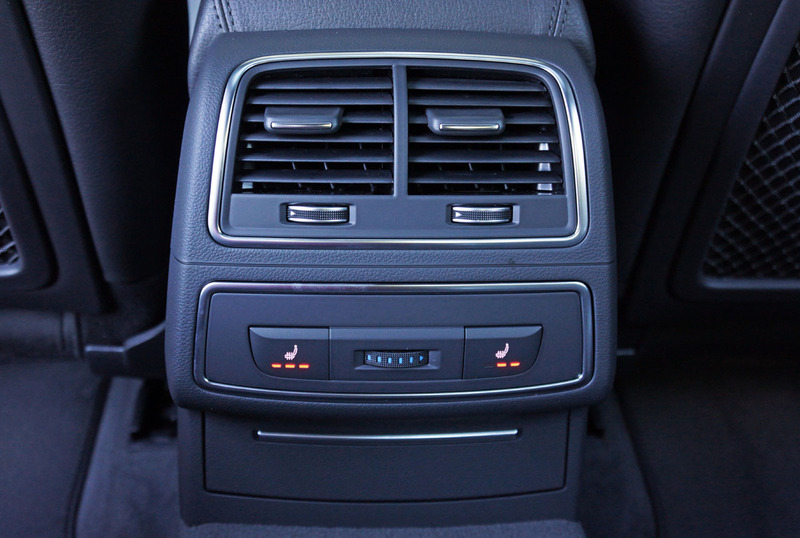 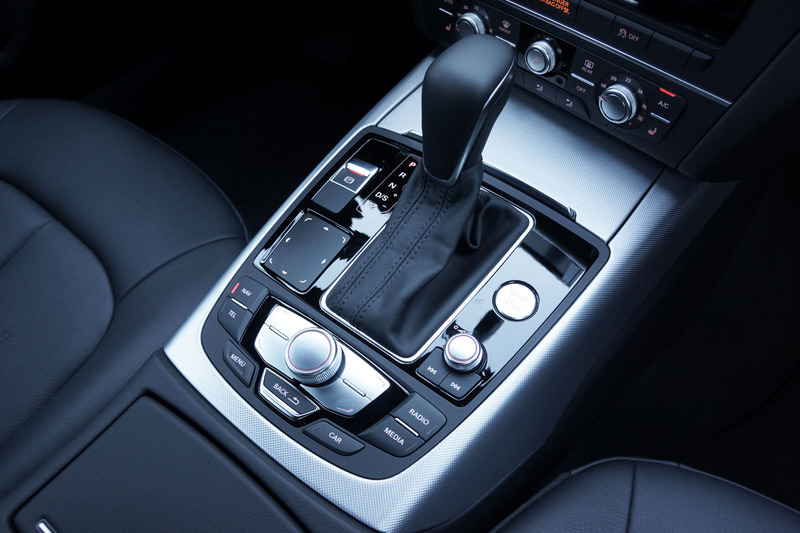 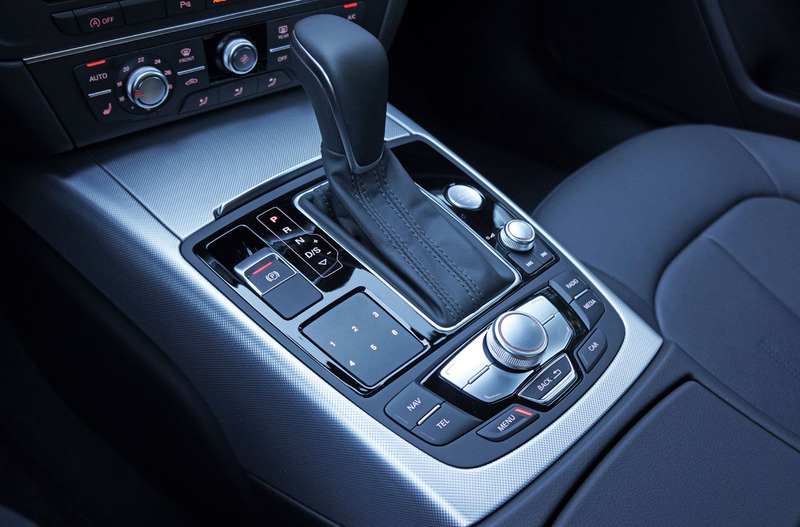 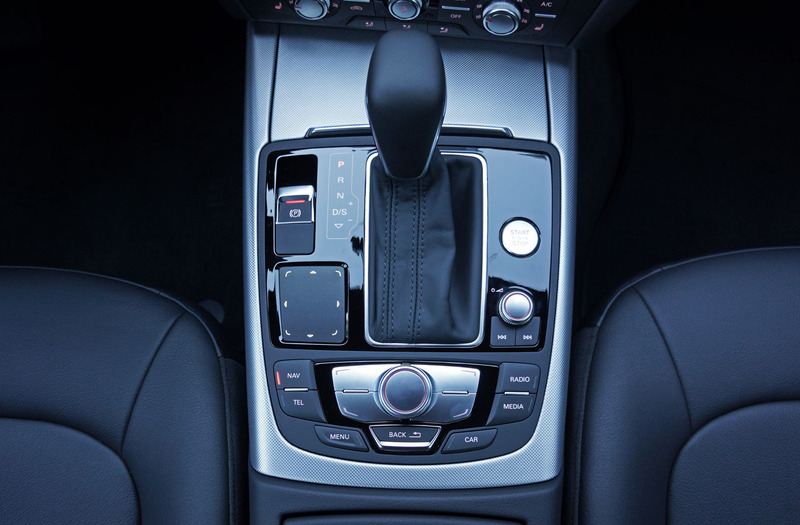 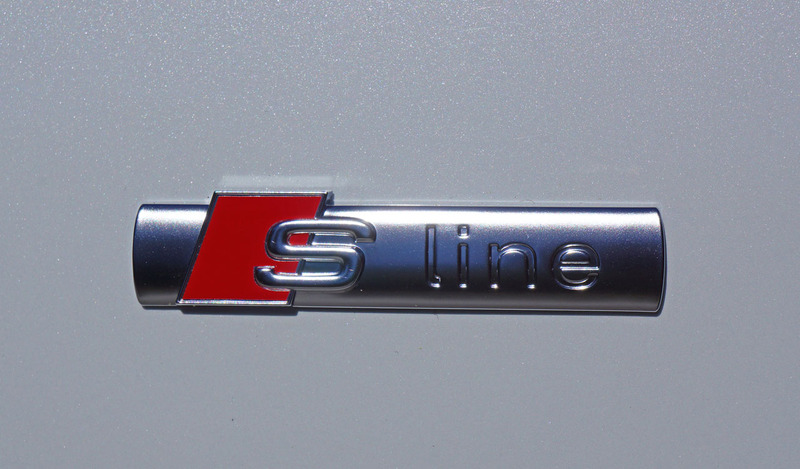 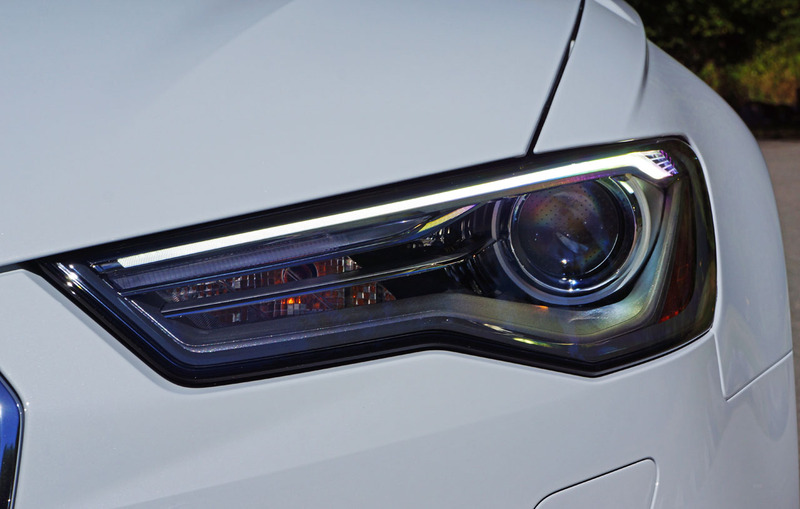 All in all Audi’s MMI is a user-friendly system as long as you give yourself a little time to learn its processes. 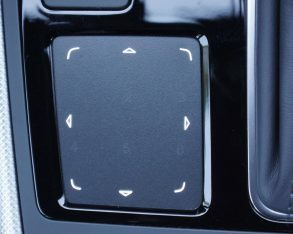 After that, there’s almost no end to what it can do. 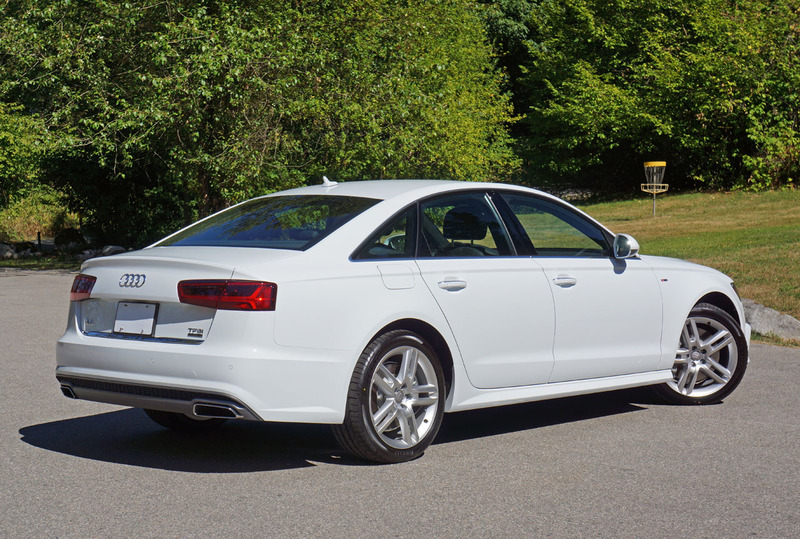 even better surround view monitor gives you a much more thorough 360-degree bird’s-eye viewpoint, while standard front and rear parking sensors beep if you get too close to something that might mar the A6’s beautiful paintwork or glistening chrome mouldings, and you’re off unscathed. 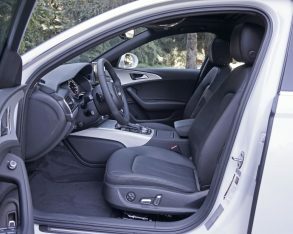 and all the usual safety equipment including knee blockers for the airbag system. 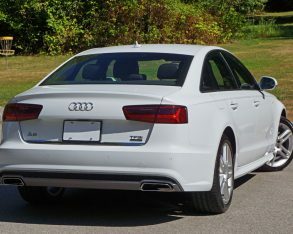 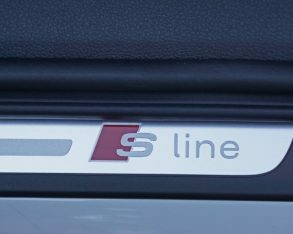 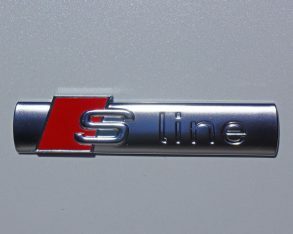 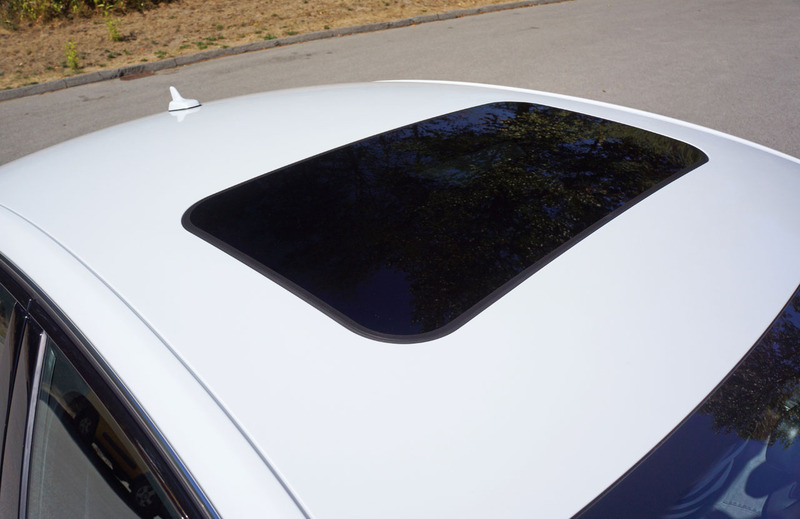 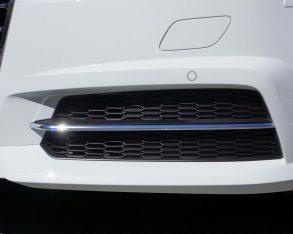 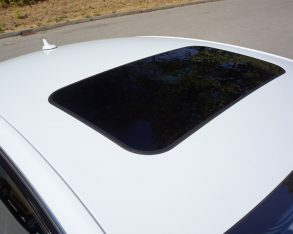 As mentioned my tester included the $1,600 S Line sport package that includes the 19-inch alloys I spoke of earlier, unique bumpers (that are worth the price of admission alone), S Line doorsill plates and a black roofliner. 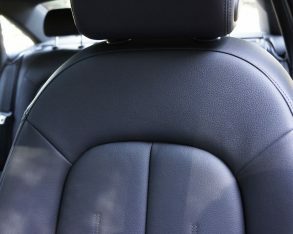 airbags can be added for $400. 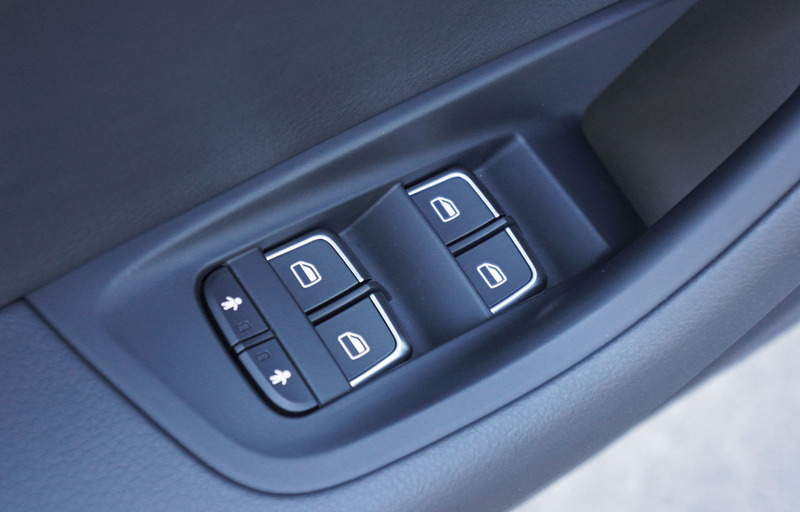 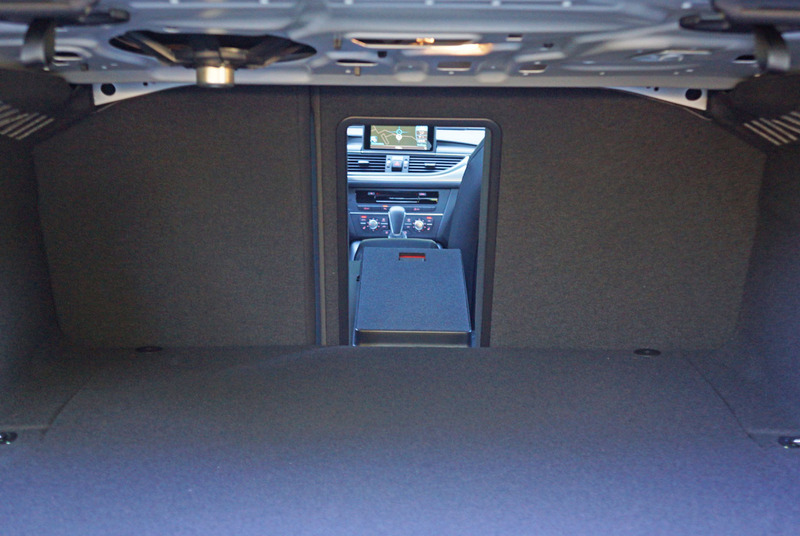 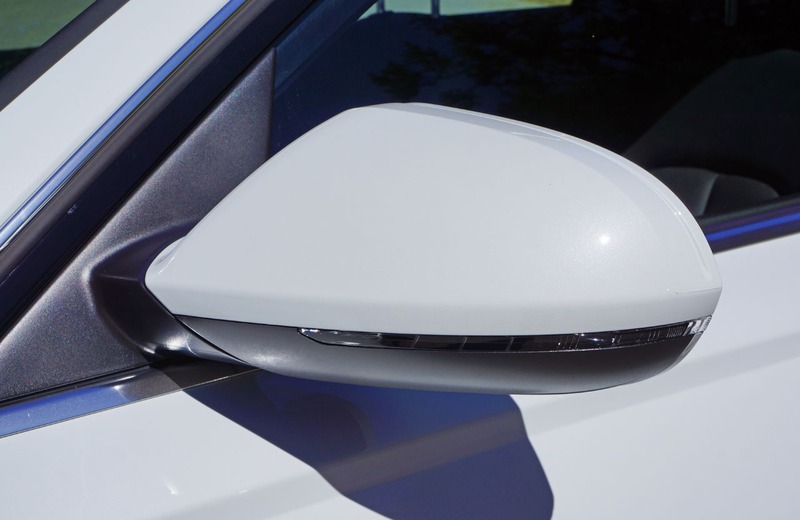 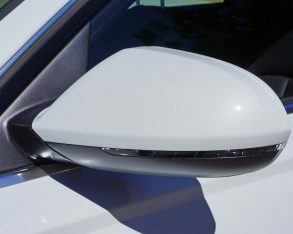 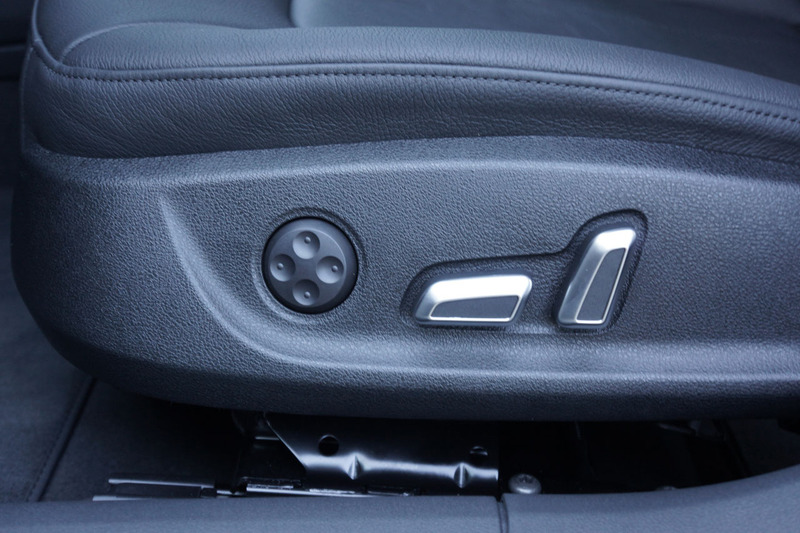 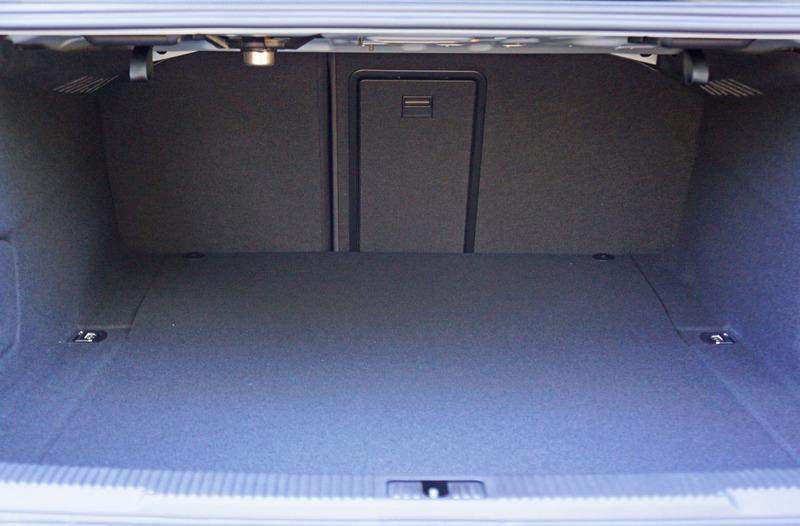 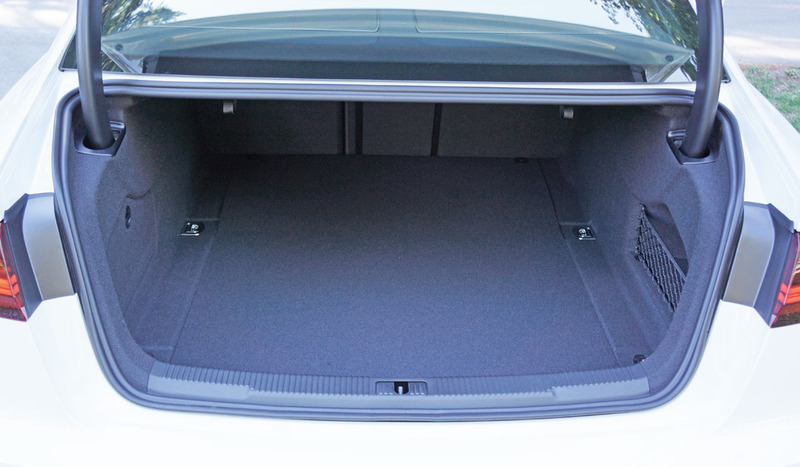 You can get the rear airbags with Progressiv trim as well, while the garage door opener will set you back $250. 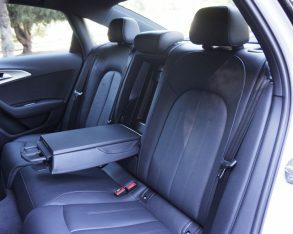 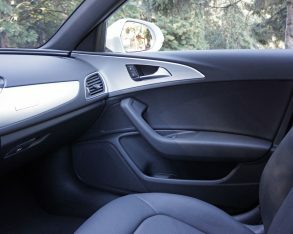 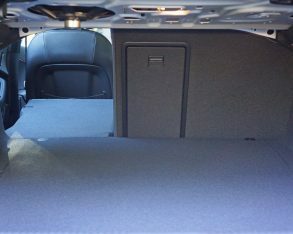 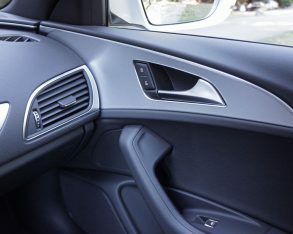 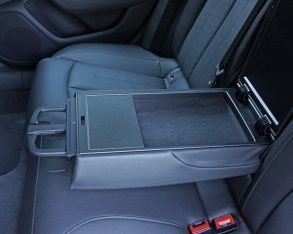 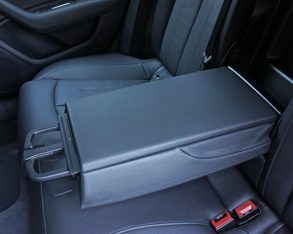 Additionally, Technik (Technology) buyers can upgrade to the $2,750 Multicontour and Ventilation package that adds even more comfortable 14-way power-adjustable front seats with ventilation and massage function plus memory for the front passenger, while all seating positions are covered in plusher Valcona leather. 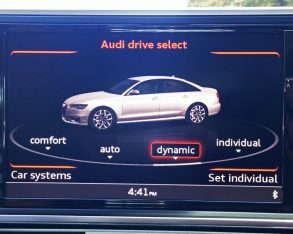 Lastly, a $2,900 Driver Assistant package adds Audi pre sense plus, active lane assist, and adaptive cruise control with stop and go function. 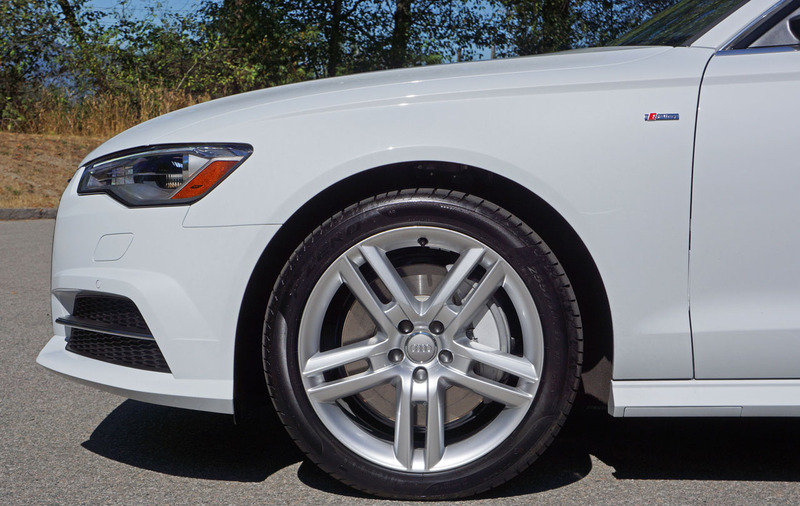 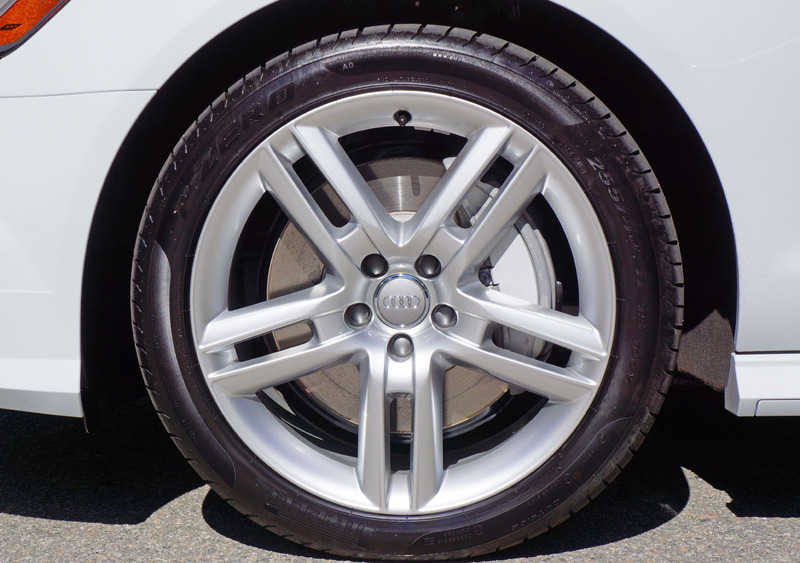 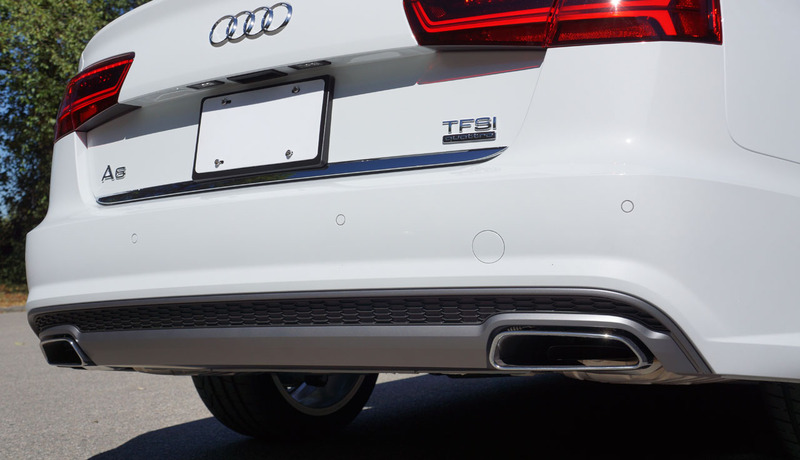 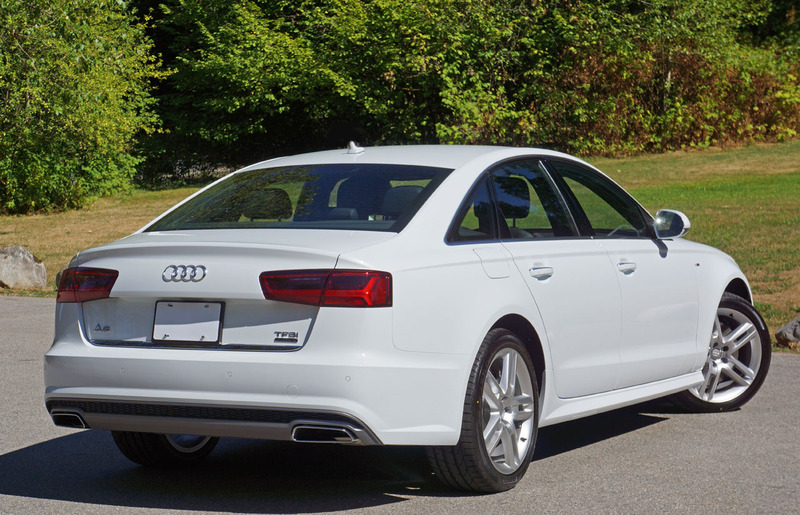 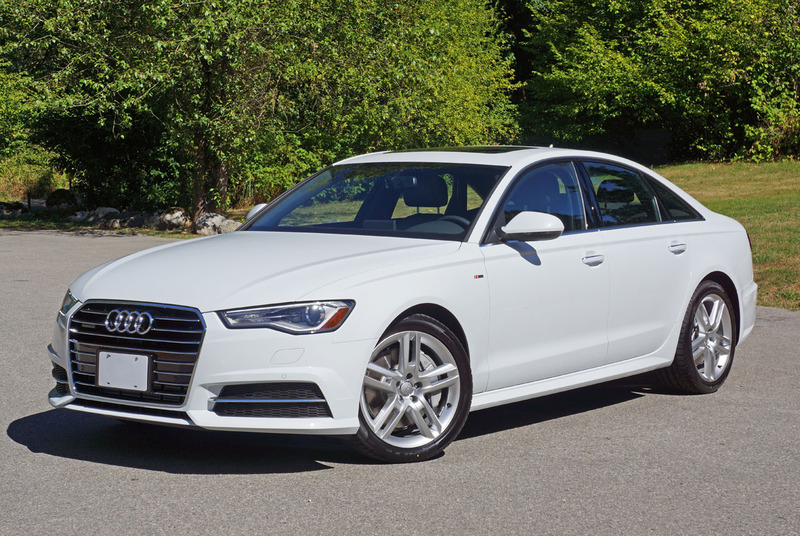 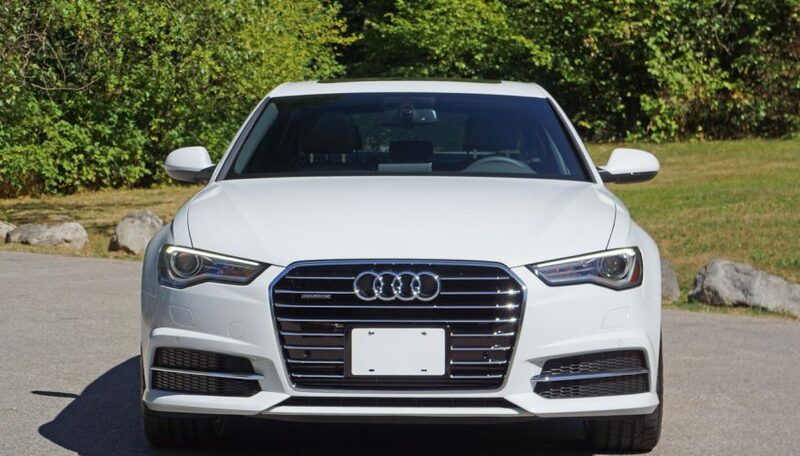 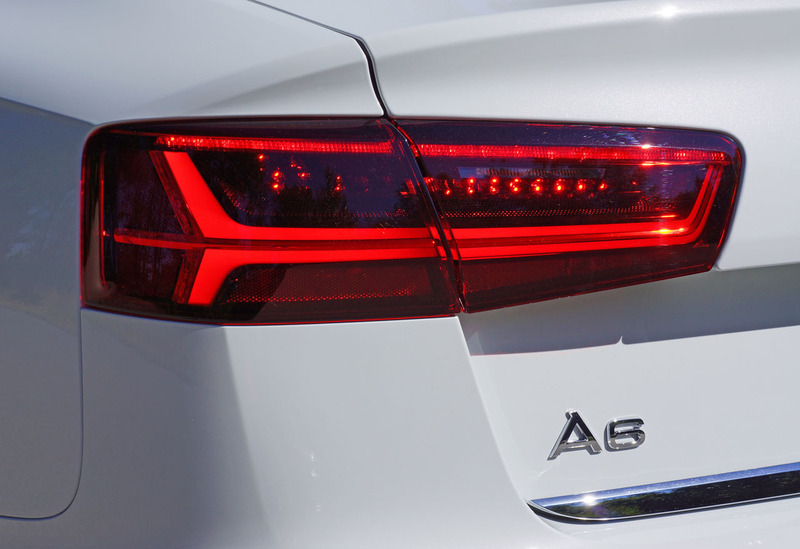 So equipped the newest A6 was given a 2015 IIHS Top Safety Pick+ rating. 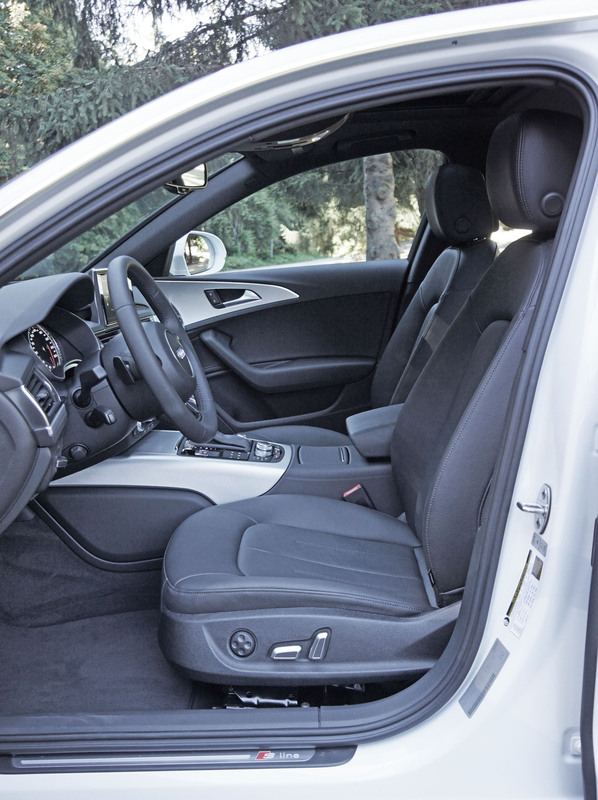 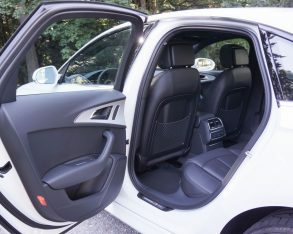 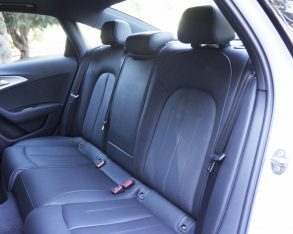 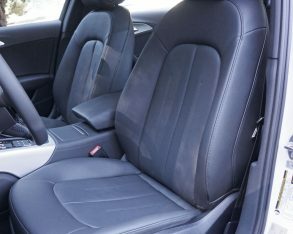 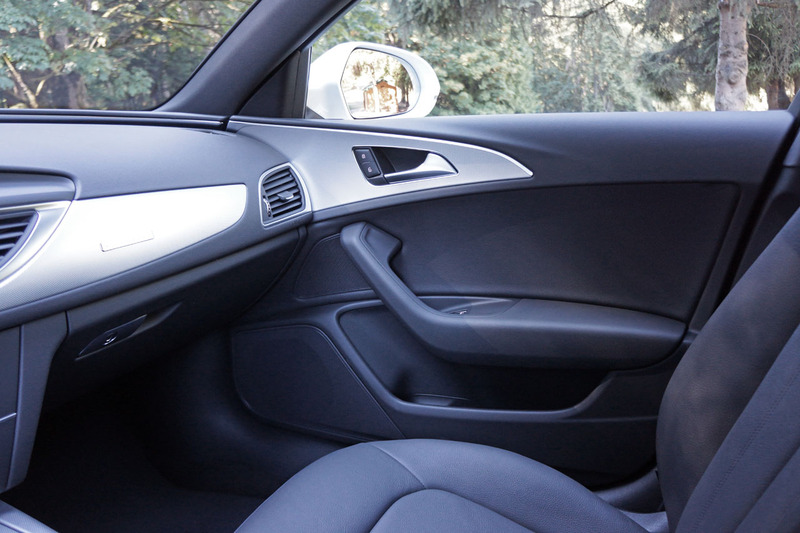 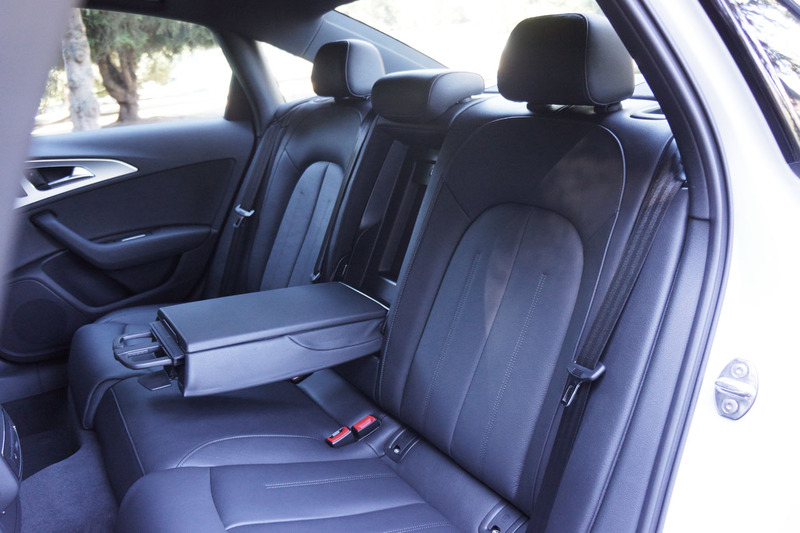 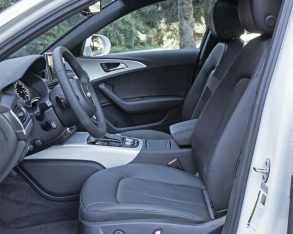 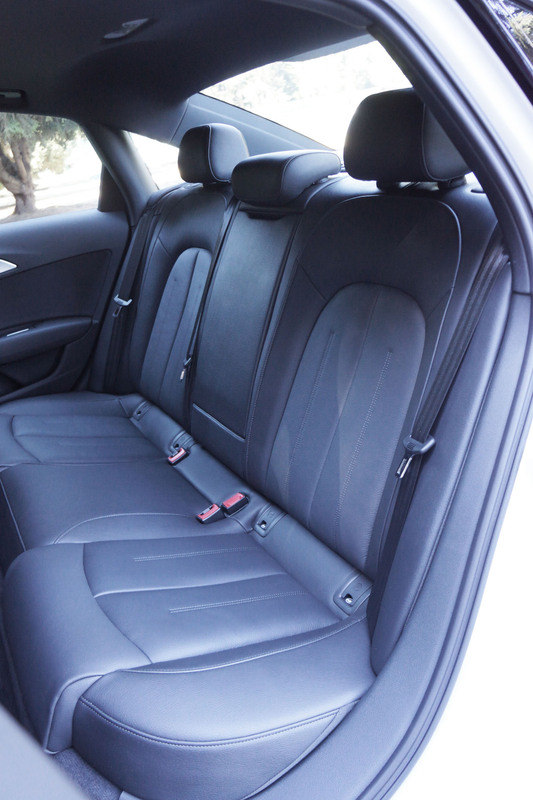 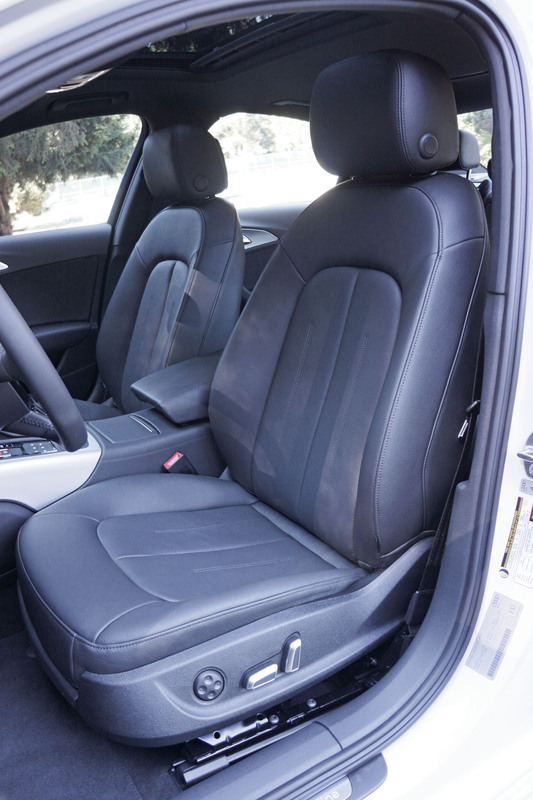 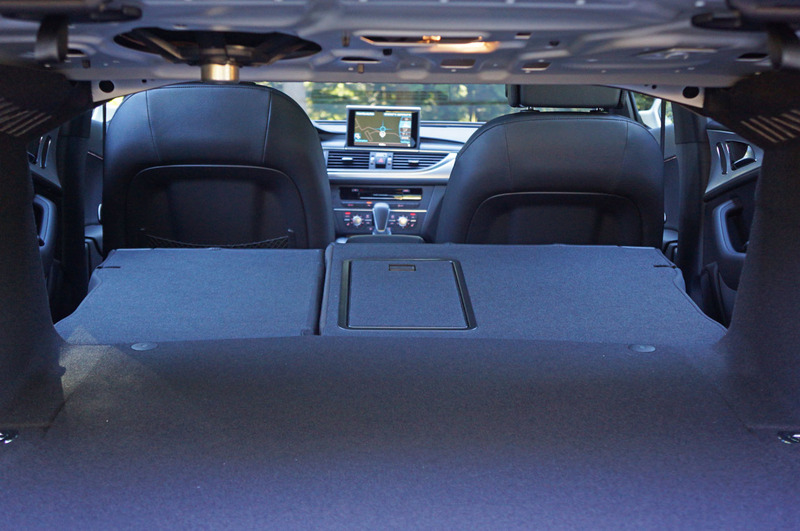 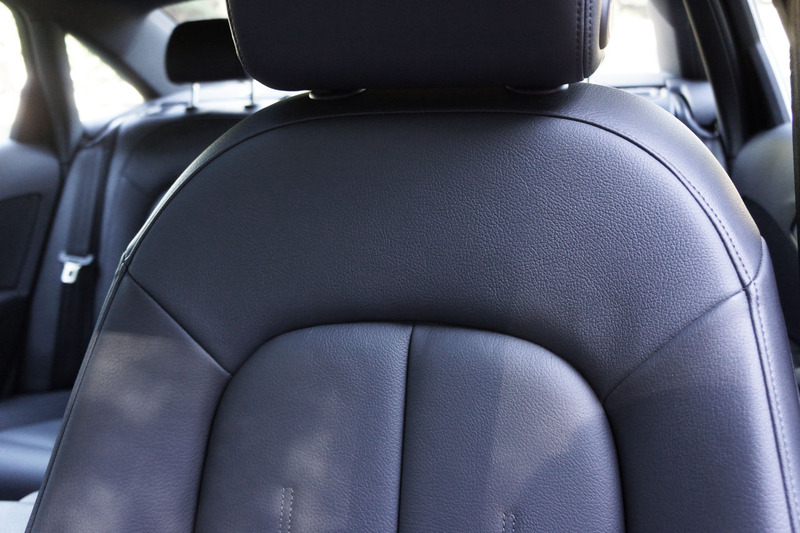 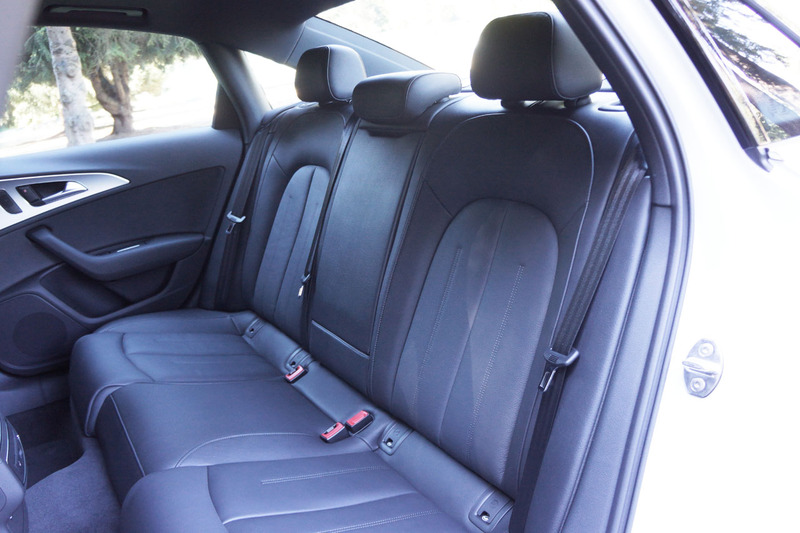 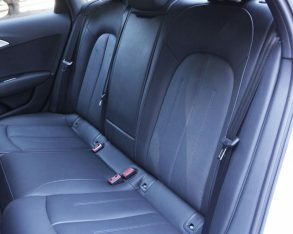 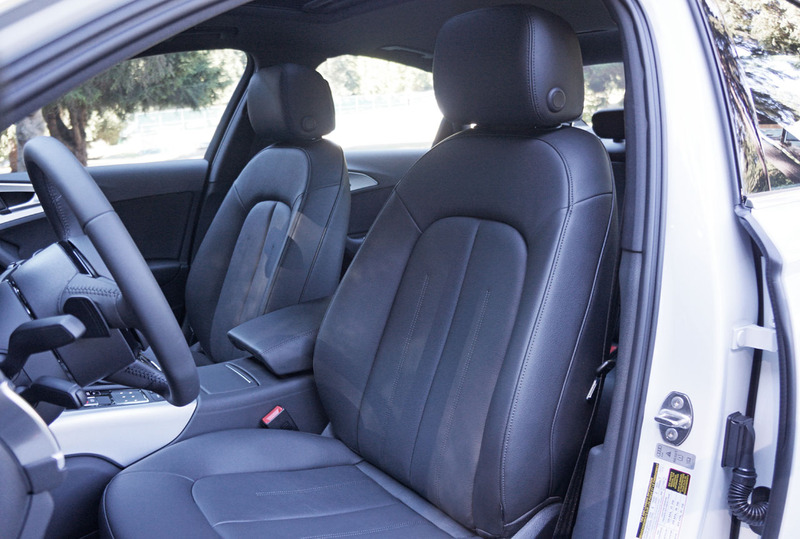 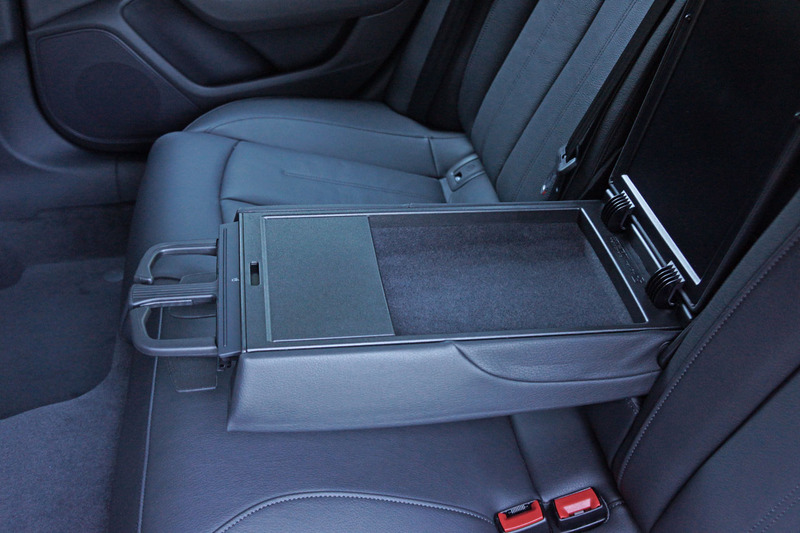 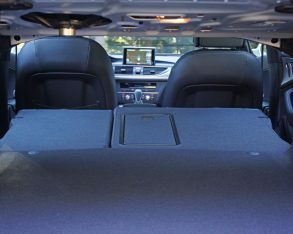 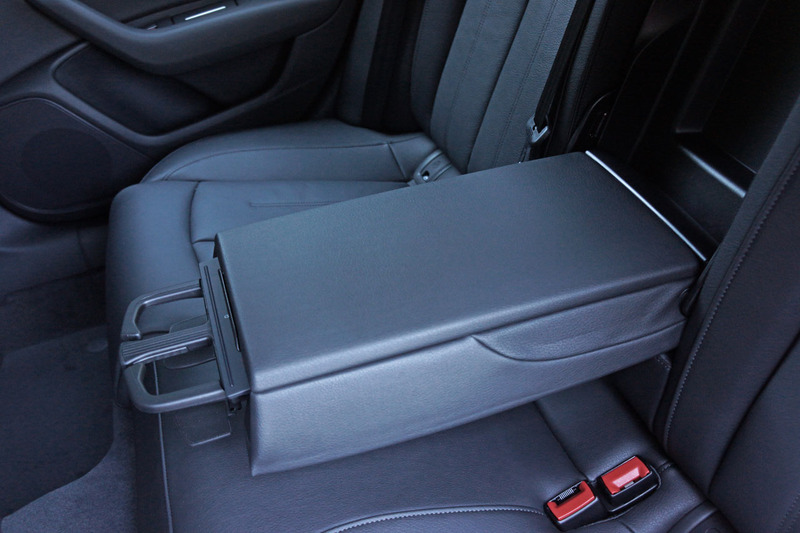 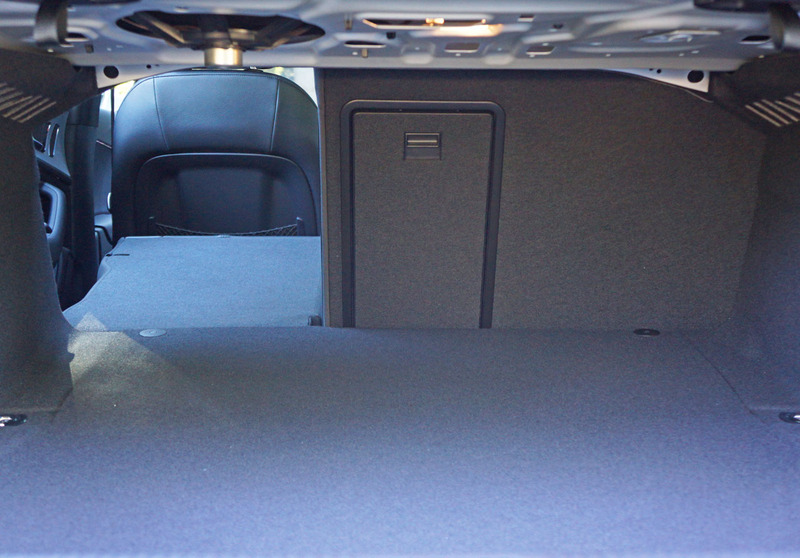 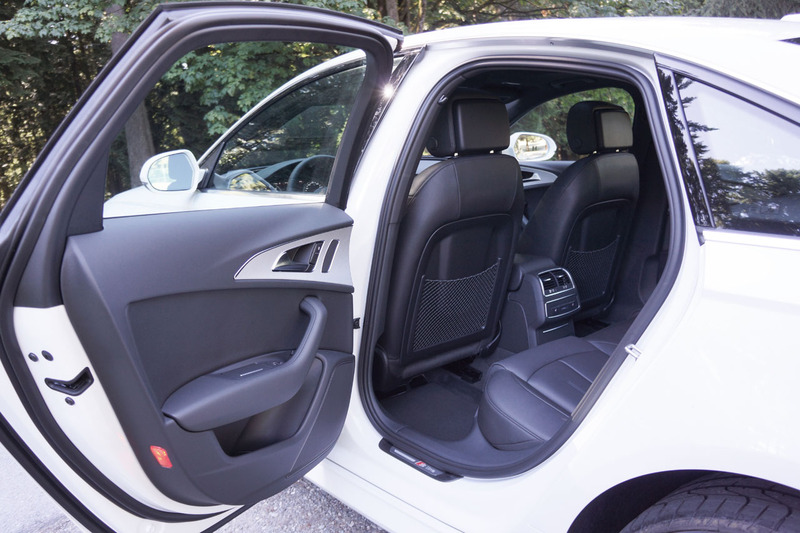 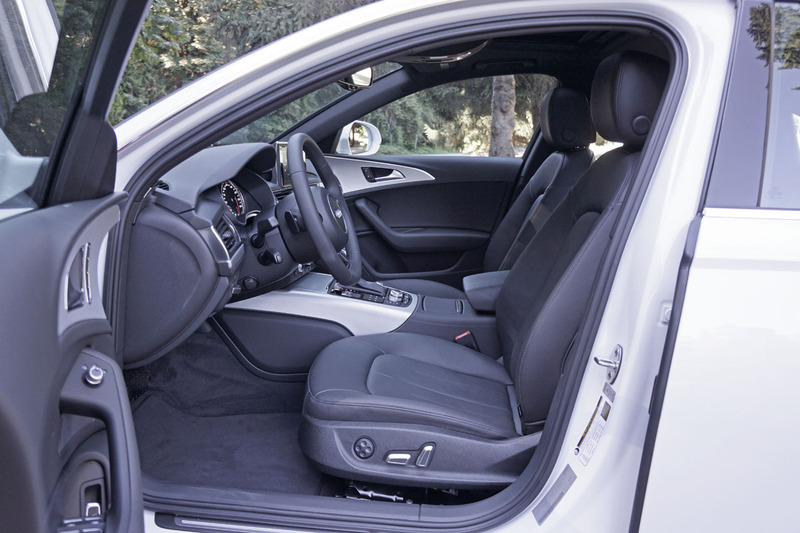 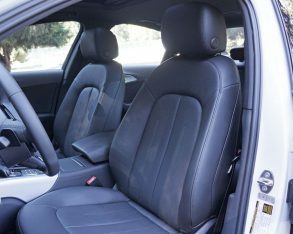 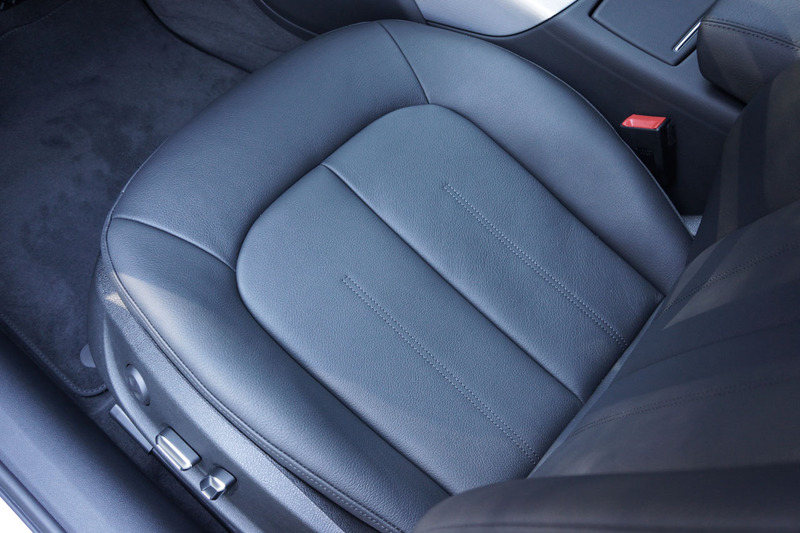 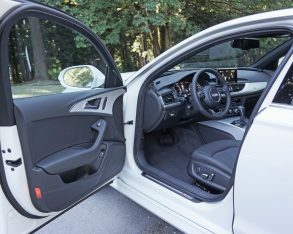 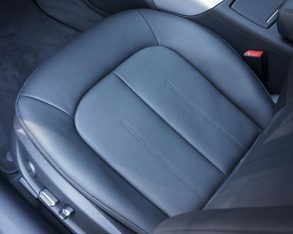 to a four-door sedan that’s very accommodating both front and back, the rear seats allowing room for three adults in comfort, although if only two are aboard a fold-down armrest enhances the art of relaxation. 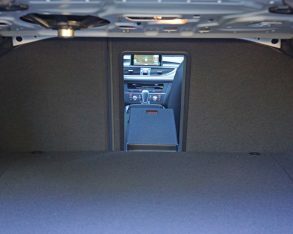 My five-foot-eight frame found more than enough space to stretch out, while I still had inches above my head and in front of my knees making me fairly confident six-footers and taller shouldn’t have a problem fitting in. 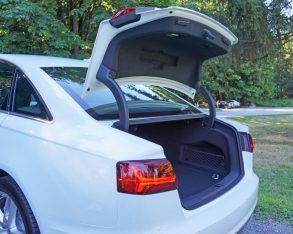 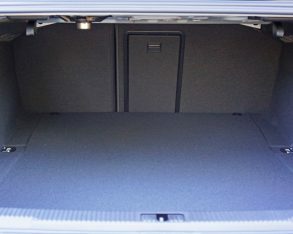 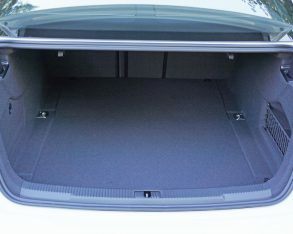 The 399-litre (14.1 cubic-foot) trunk should be ample for most peoples’ needs too, while the rear seatbacks fold forward in the usual 60/40-split and extra versatility of a pass-through allows more comfortable window seating for two rear occupants while skis or what-have-you are stowed in between. 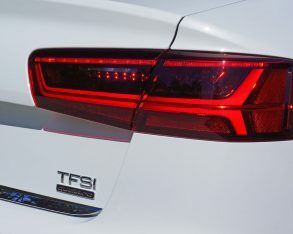 (and very impressive) CTS found 1,076 new owners last year (and previous years have had it in the high 3 to low 4k range), and Tesla that was able to attract 847 Model S buyers in 2014 and is already at 742 for the first half of 2015. 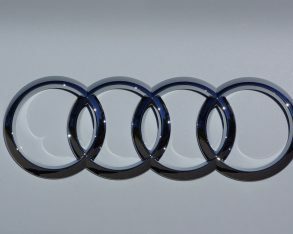 If Tesla keeps sales growing in this upward trajectory it will quickly (and quietly) slip past Audi into the third sales spot in this segment (unless Cadillac gets there first), and all without the aid of internal combustion power-who would’ve thought? 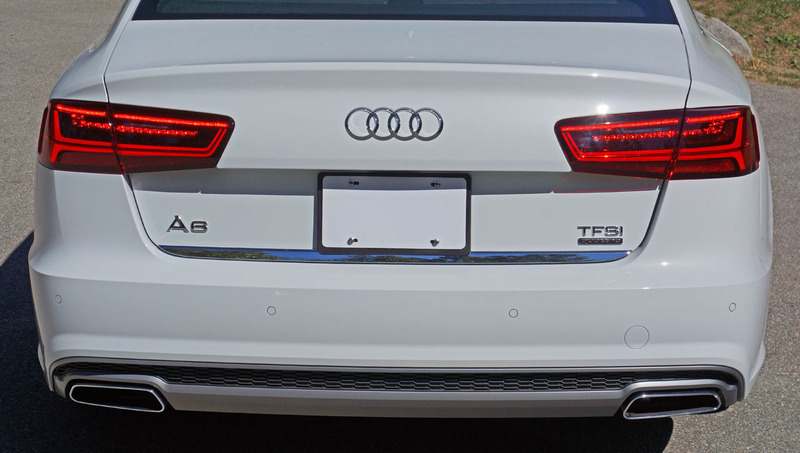 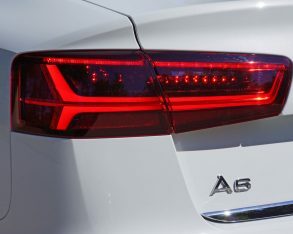 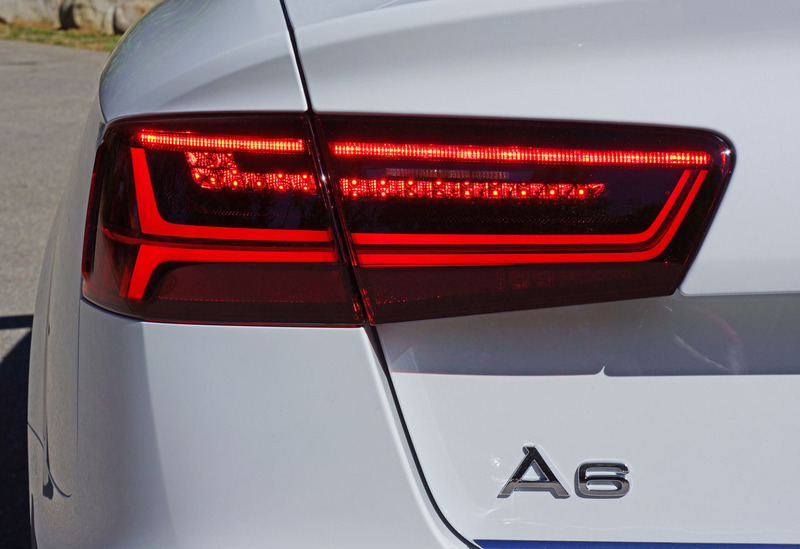 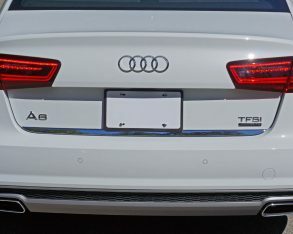 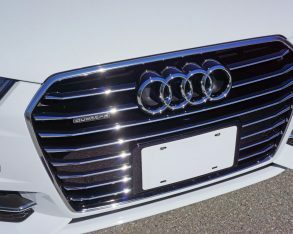 This updated A6 should improve sales, so it appears the race is on. 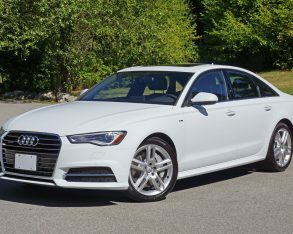 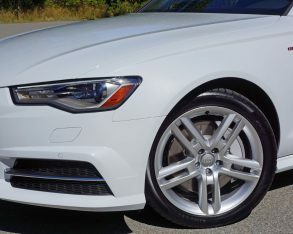 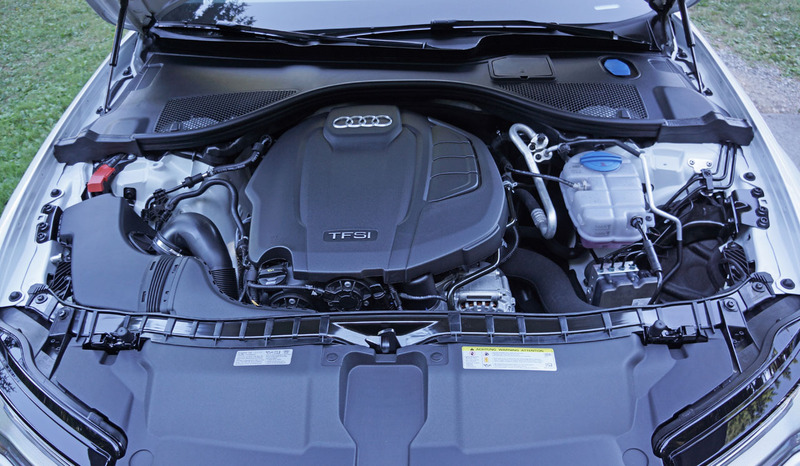 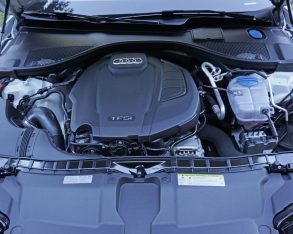 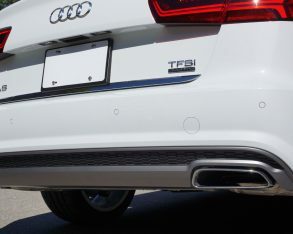 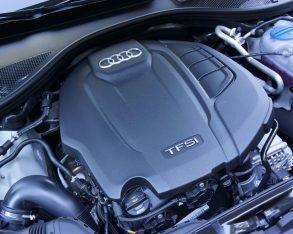 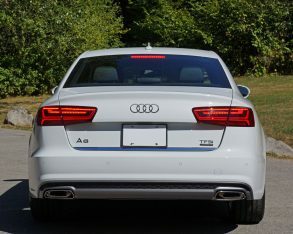 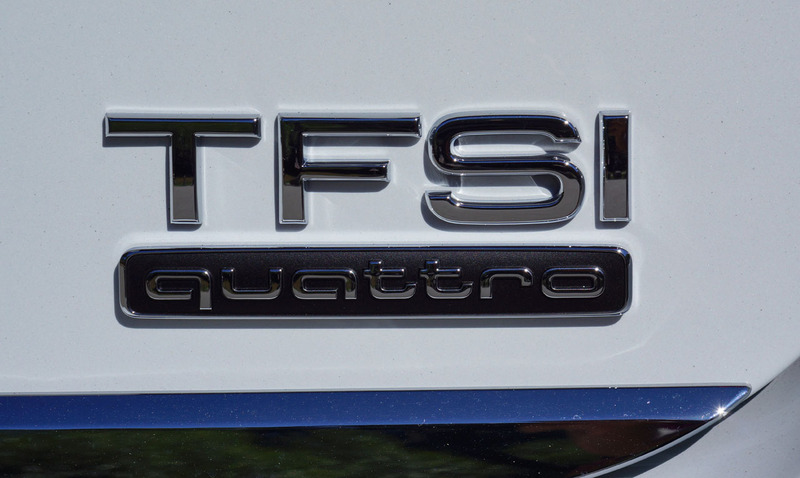 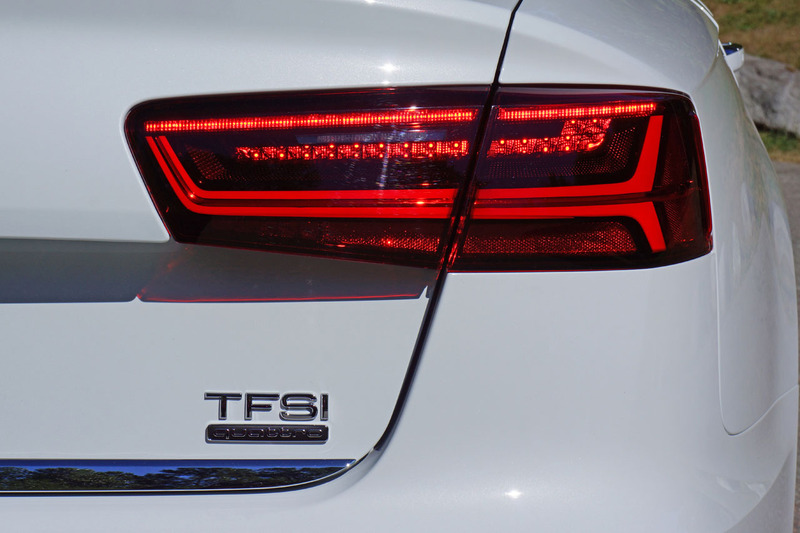 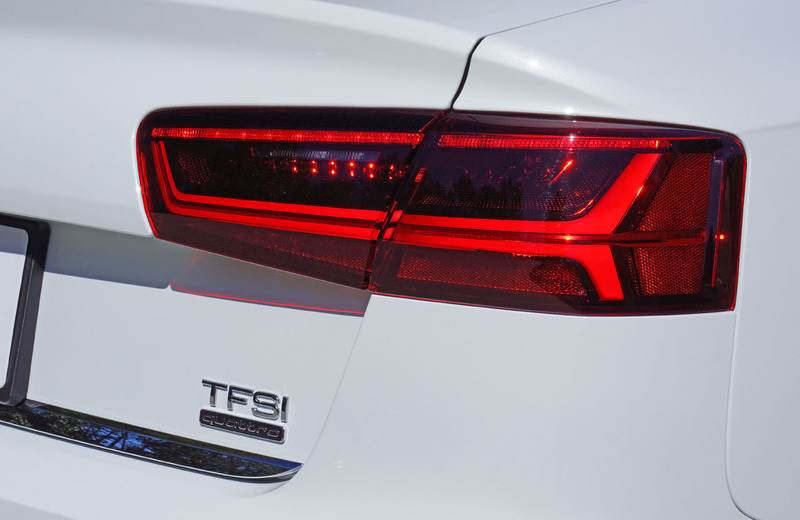 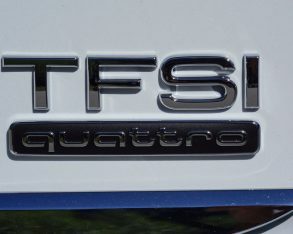 Nevertheless a great deal is changing within the mid-size premium segment and to Audi’s credit its extremely fuel-efficient clean diesel TDI powerplant remains part of the A6 offering for just $66,100, or if it’s performance you’re looking for, a 333 horsepower 3.0 TFSI turns most competitive six-cylinders on their heads for just $63,700; and don’t get me going about the $88,500 450 horsepower S6 that I touched on earlier. 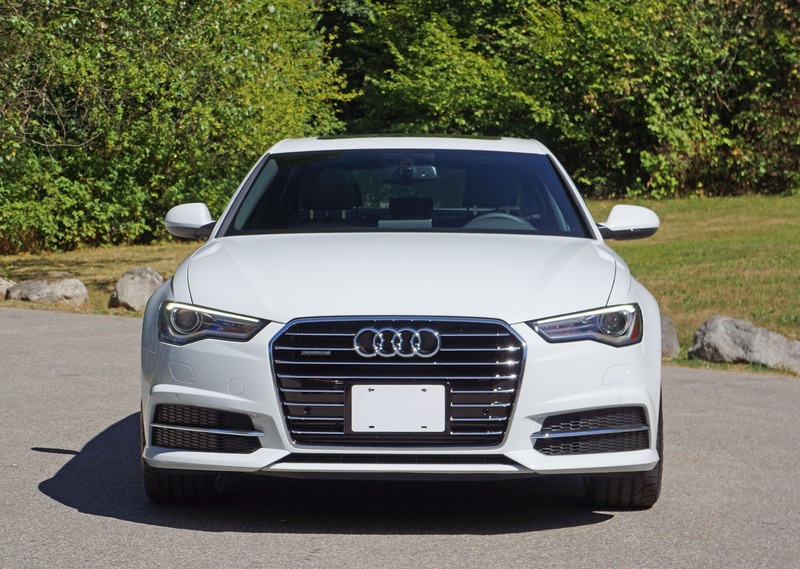 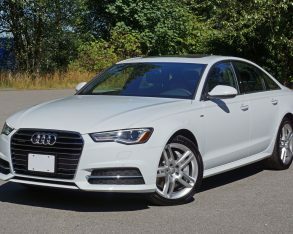 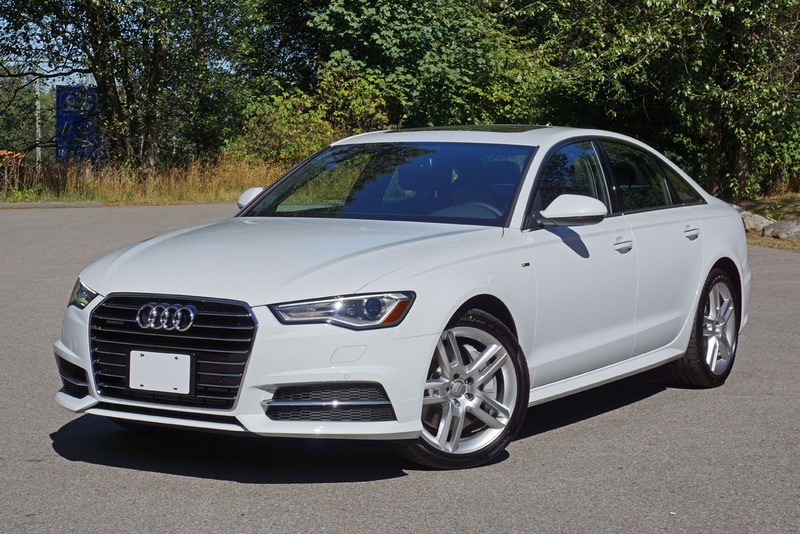 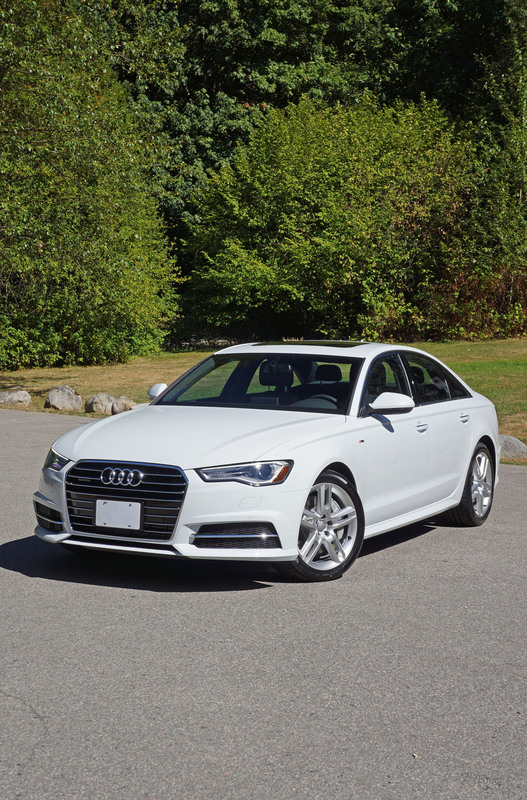 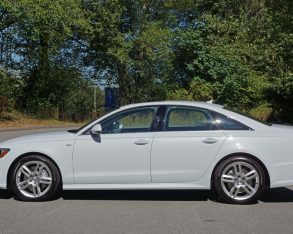 Its few tactile quality issues aside, the Audi A6 is one of those rare sport-luxury sedans that does most everything right, and due to head-turning style, impressive performance and all bases covered on the practical front, is well worth your attention.